This was our first visit to Finland where life seems to be all about the sauna. They estimate there is one sauna in Finland for every two people. Most homes and apartments have one. There is even a ferris wheel in downtown Helsinki where two of the cars are saunas! 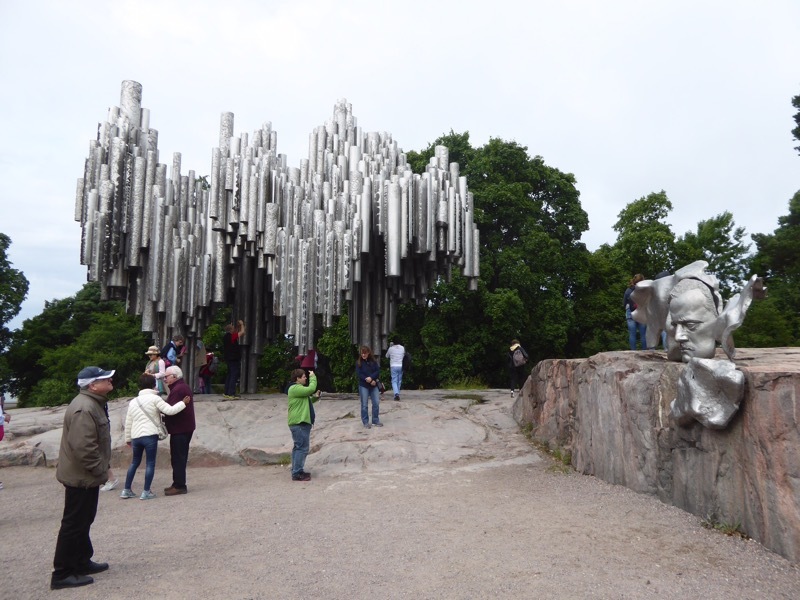 This is a monument to Finland’s number one composer, Jean Sibelius. 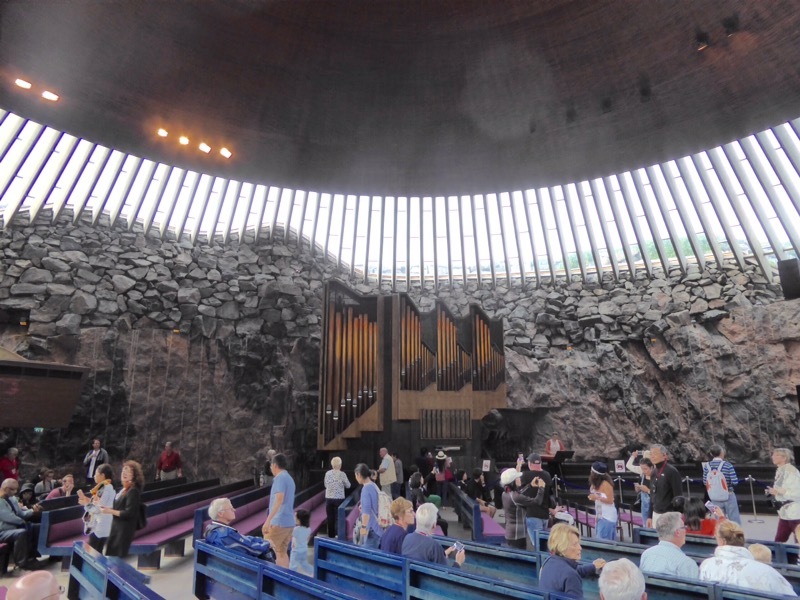 The Church in the Rock is one of the most popular sites in Finland. The church was constructed by blasting a hole in solid granite. 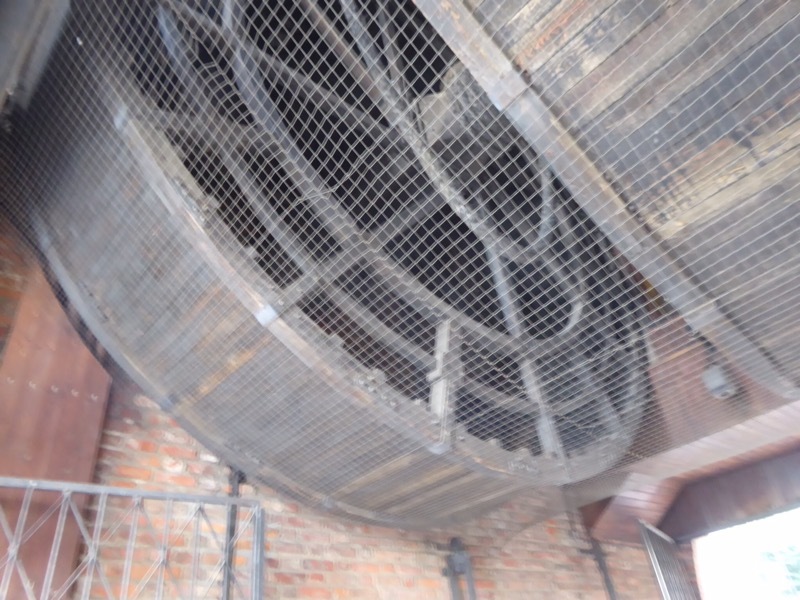 The roof is a coil made from a thirteen mile strip of copper. 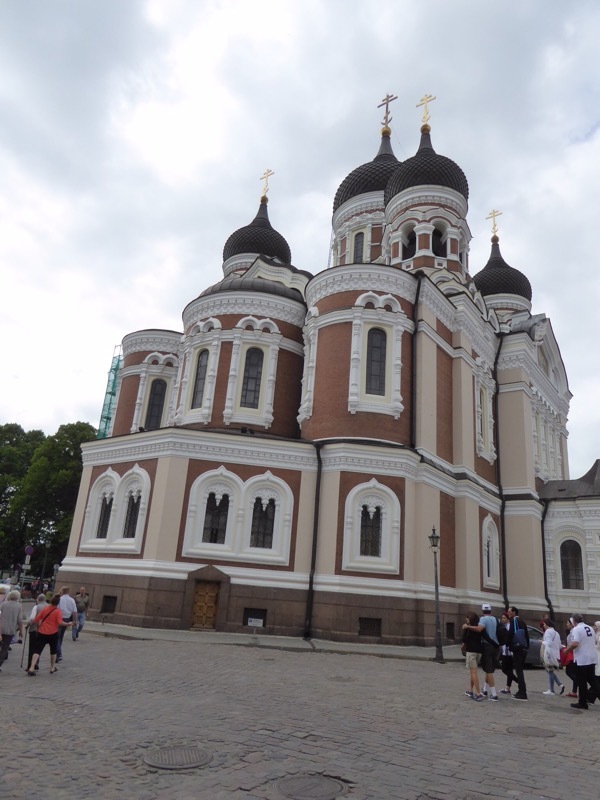 The Cathedral in the historic area of Helsinki. 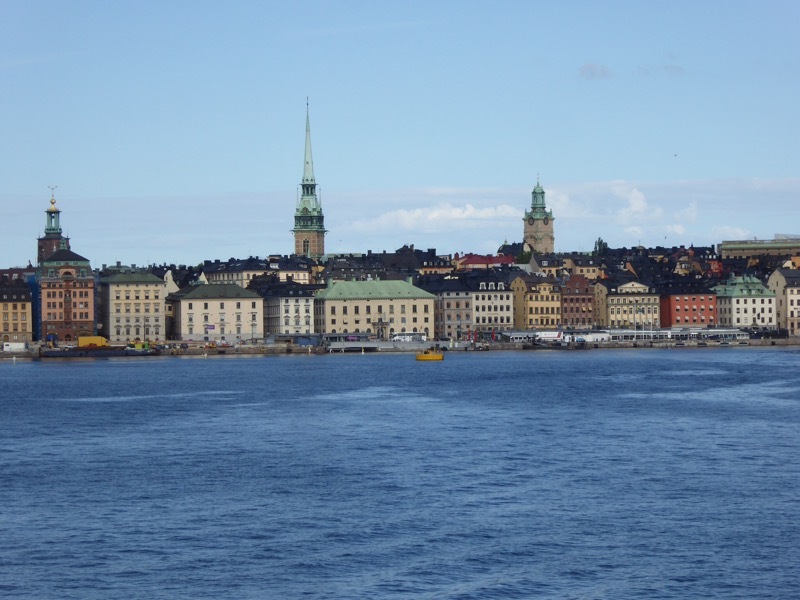 The final stop on our cruise was Stockholm, which we both loved. The city is filled with beautiful, old buildings. 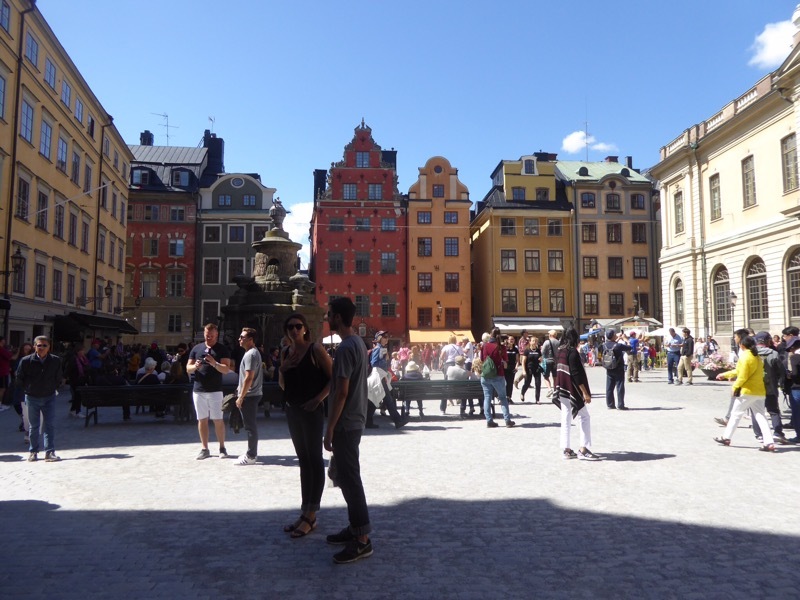 Because Sweden remained neutral in the World Wars, the buildings are mostly original. The old town from the water front. 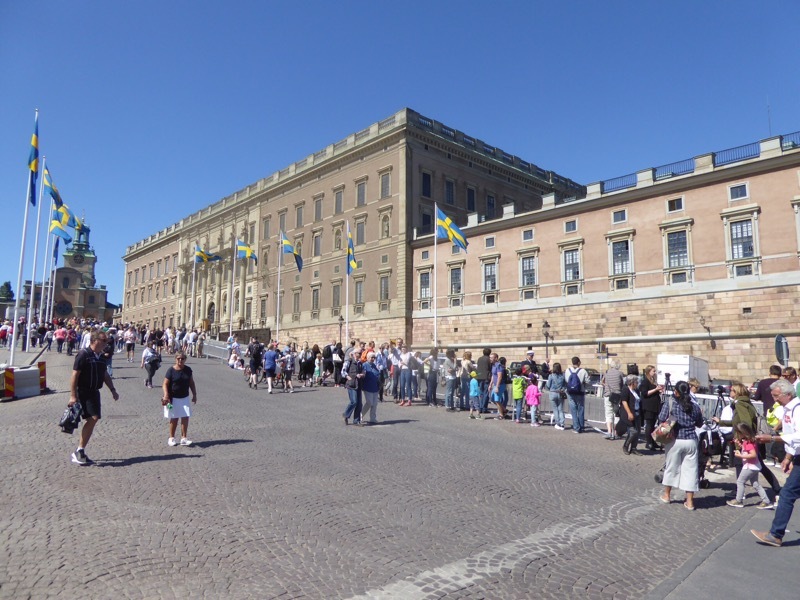 The queen of Sweden celebrated her birthday on Friday, and people are beginning to line up in front of the Royal Palace for the parade in her honor. 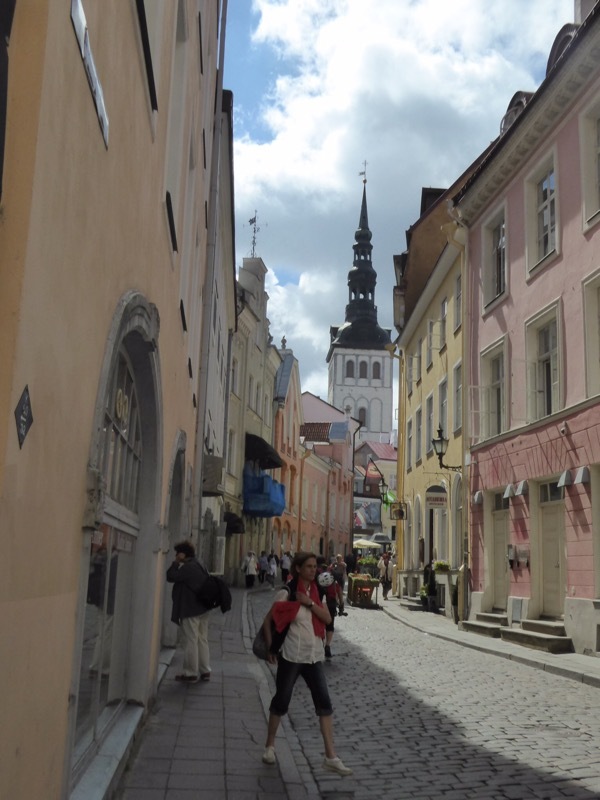 One of the many squares in the old town. 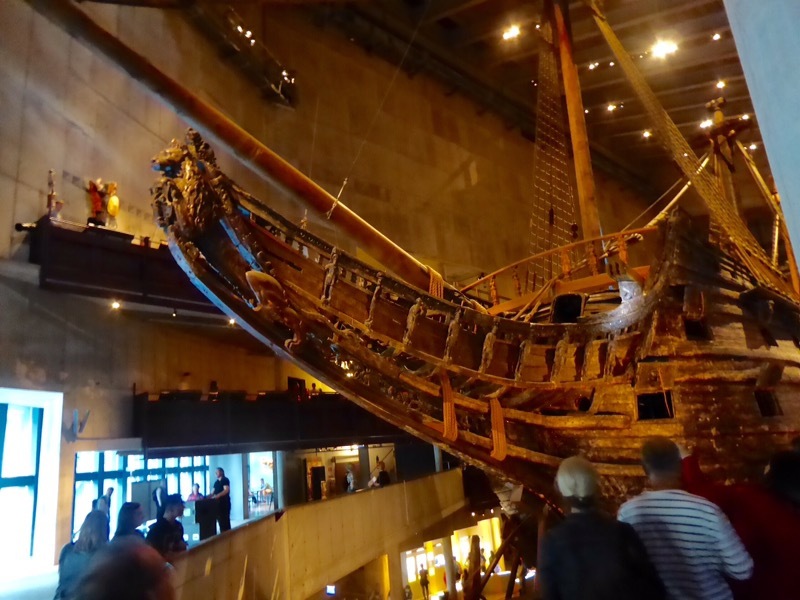 The Vasa was a powerful warship ordered to be built by the Swedish king both to assist in expanding his territory and to impress the home folk. It was one of the largest ships at sea when it was built nearly four hundred years ago. It had rows of cannons located on two levels. Unusual for the time, all the cannons were built uniformly so any cannonball could fit in any cannon. The ship was lavishly decorated with more than five hundred sculptures scattered around the ship. 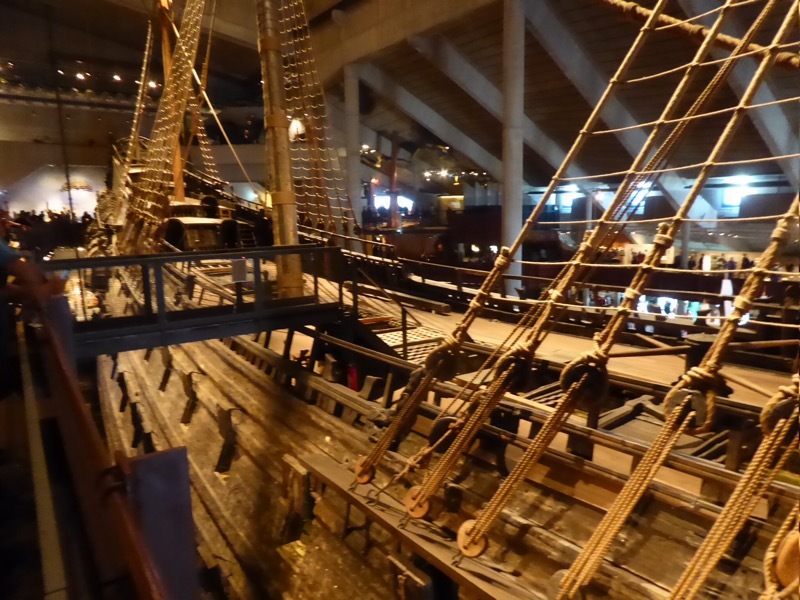 The Vasa had its grand launching in Stockholm in 1628 with all the cannons deployed to impress the people watching from the shore. The two levels of canons and the sleek narrow design made the ship very top heavy. The ship sank forty minutes into its maiden voyage. A gust of wind caught the sails and caused the ship to lean to the portside. The clearance between the water level and the bottom of the holes for the lower row of cannons was only four feet. Water started to fill the ship through these holes. Because of the tilt, the crew was unable to pull the heavy cannons back and close the covers. The ship sank in fifteen minutes killing 30 of the 150 member crew. The death rate was low because it was close to shore and the water was shallow so the masts were above water so survivors could hold onto the rigging until they were rescued. The ship sat there forgotten until it was raised in 1961. 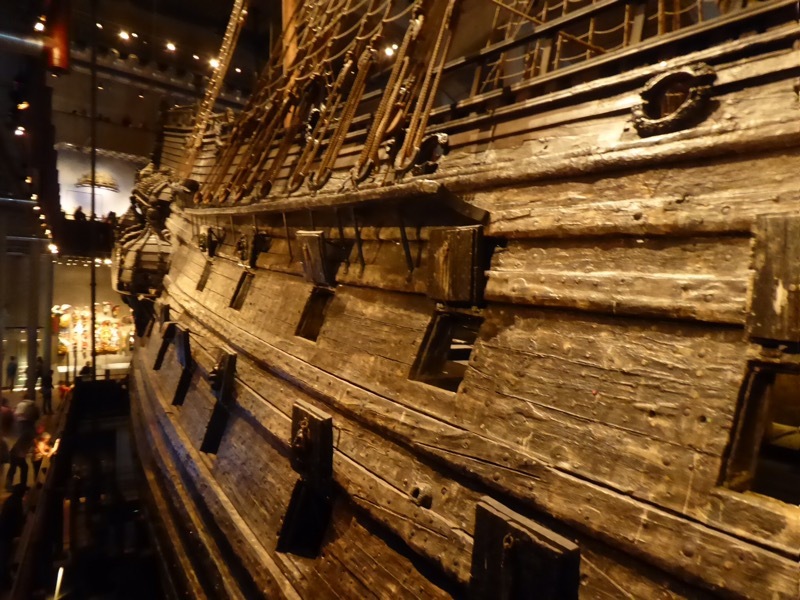 Preservation of the Vasa required keeping the wood continuously wet with polyethylene glycol for years. 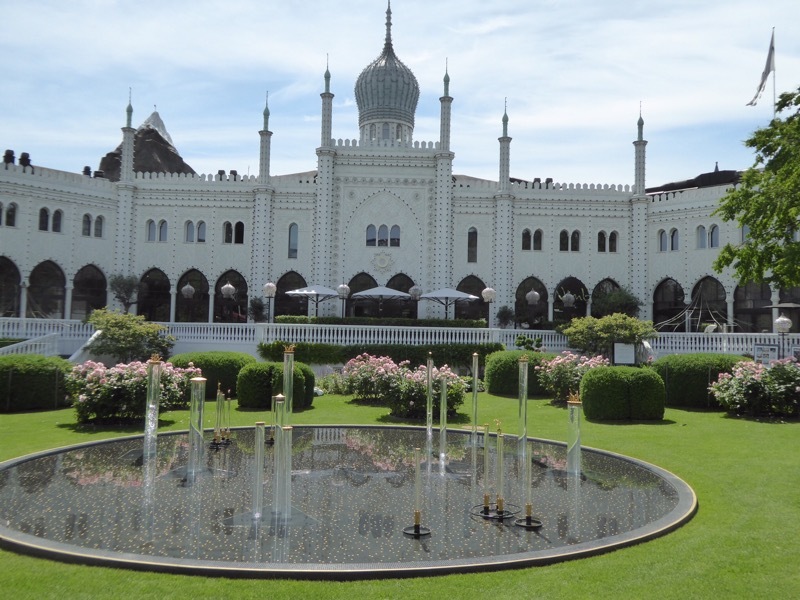 In 1990, it was moved to a large museum where it is one of the must see sights in Stockholm. 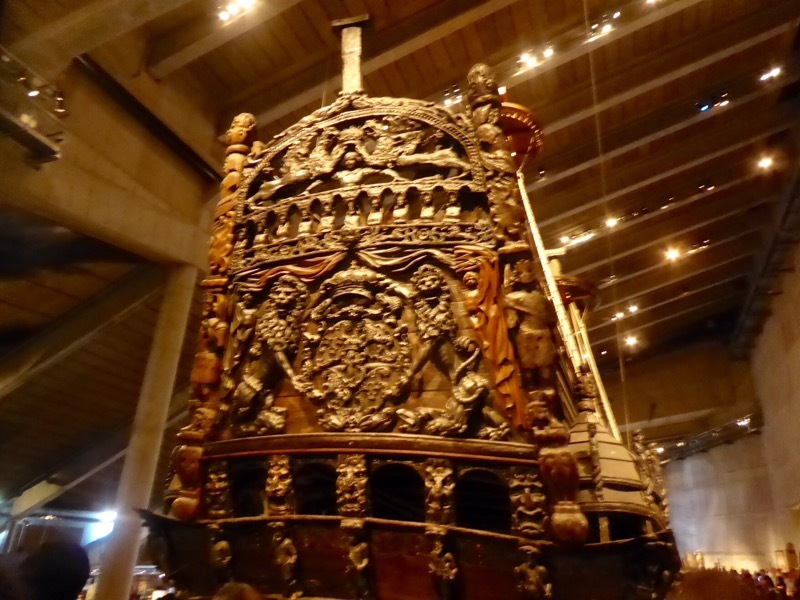 The ship was well preserved in the bottom of the Baltic so 98% of the wood we see today is original. The preservation is ongoing with rusty iron bolts being replaced with stainless steel. The lion bow of the ship. It was hard to get a good overall view of the ship. The lighting was quite dim. I presume this is to protect the ship. This shows the two rows of openings for the cannons with the hatches open as they were when it sank. This is the top of the elaborate stern of the ship. We are now in our apartment in L’isle-sur-la-Sorgue in Provence. It wasn’t easy getting here, but more about that in the next blog. Also, Susan and I want to state clearly for the record, that while we did talk to Russians here, we never discussed anything related to any election campaign in any country! 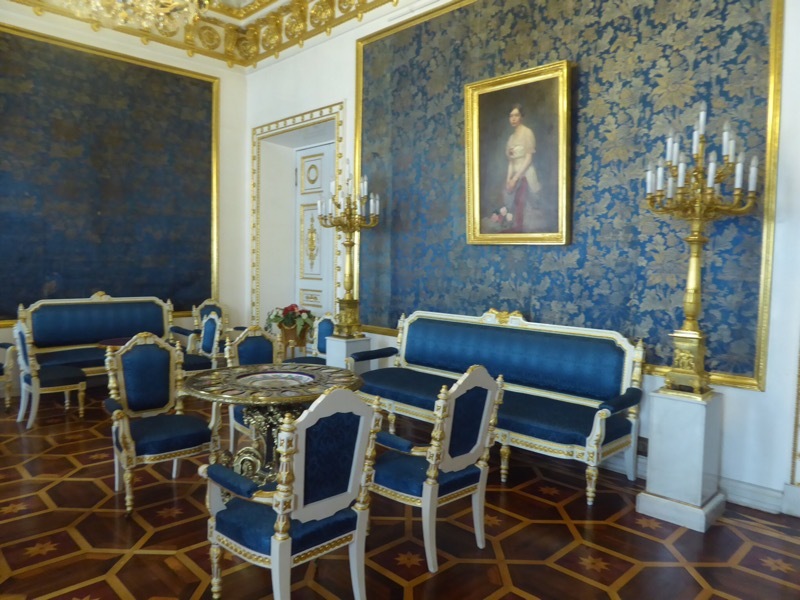 Our first tour was to the Hermitage, which we had visited previously; but this tour also included the gold room, which we had not seen. 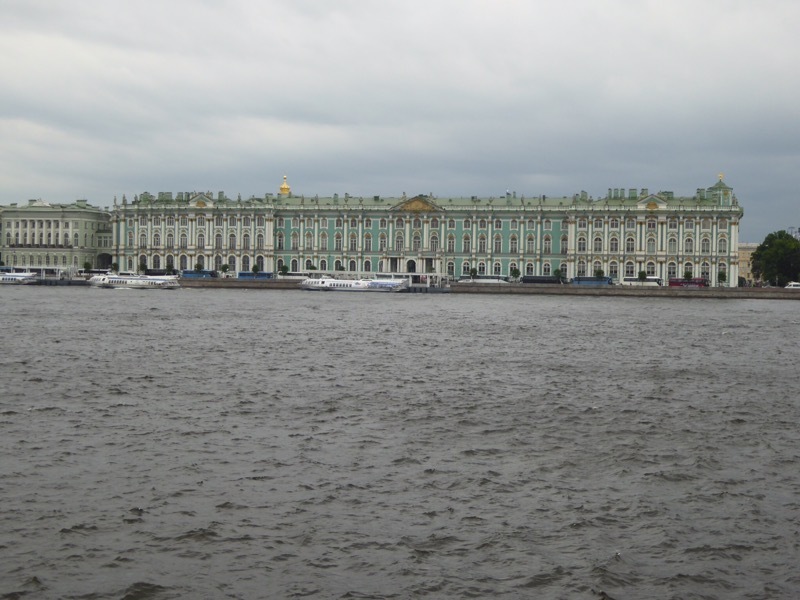 The Hermitage consists of five buildings, one of which is the former Winter Palace. The Hermitage has over three million objects to view. 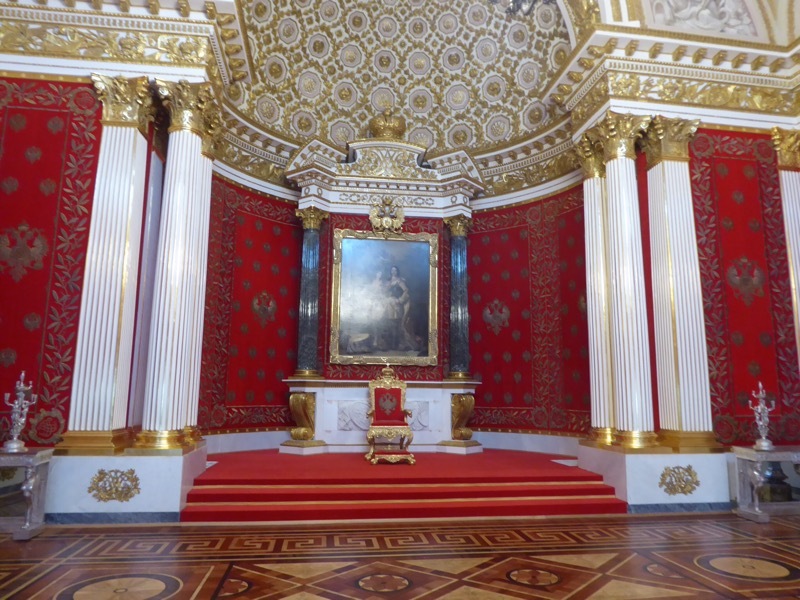 The throne room in the Winter Palace. 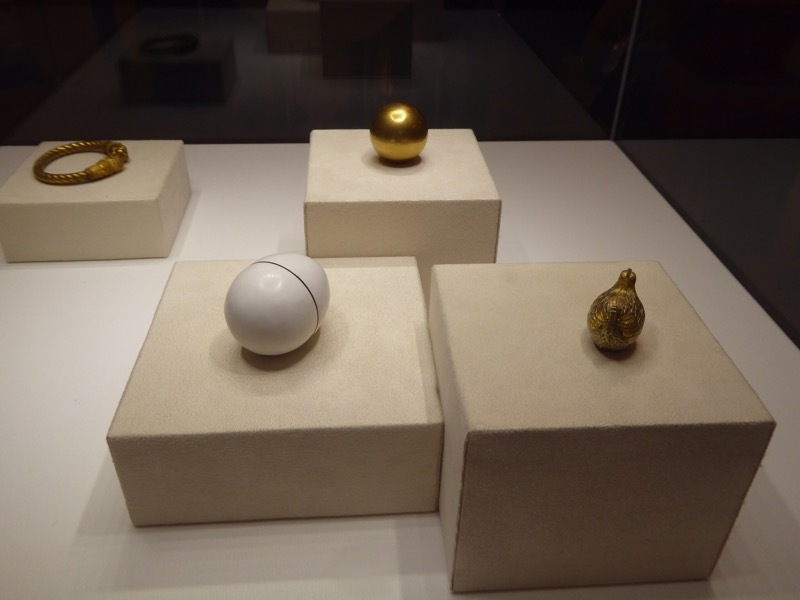 The next excursion was to the Fabergé Museum and its collection of about ten Fabergé eggs as well as other pieces by Fabergé and other artists. 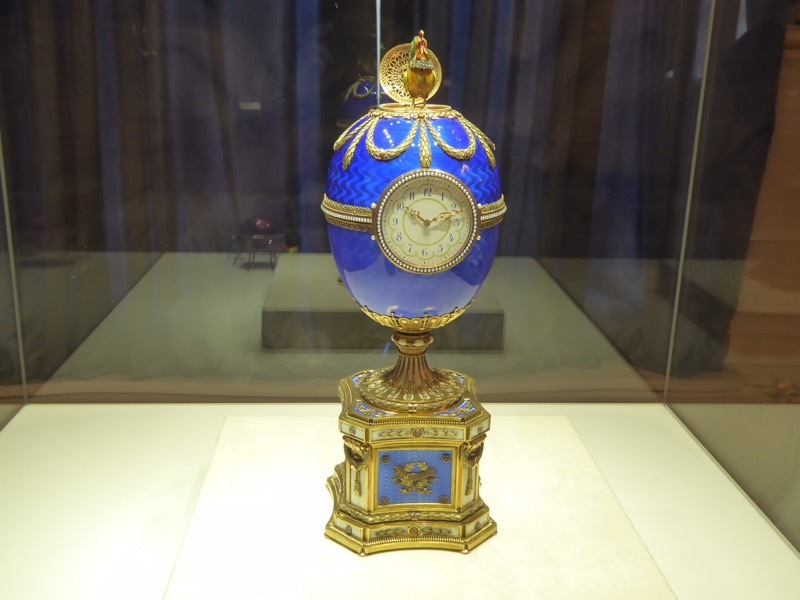 Fabergé went from this simple gold egg painted white with a gold yoke inside to… …elaborate eggs such as this one which included a clock. Many of his eggs also included a “surprise” inside. 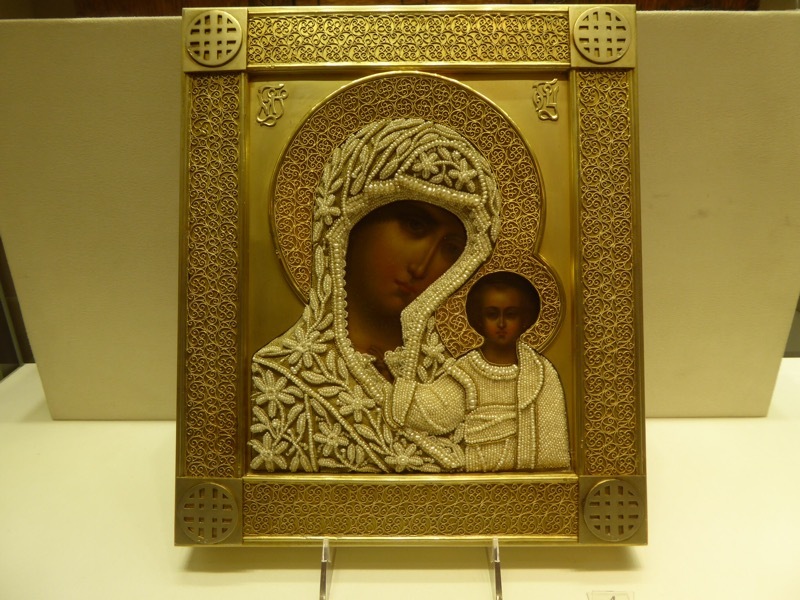 The Museum had a collection of Russian icons painted on wood and then framed and partially covered in gold. Viking includes one tour in each port free of additional charge. In St. Petersburg this was a bus trip with stops at some of the most famous sights. Saint Isaac’s Cathedral. The top coupola is apparently under repair. 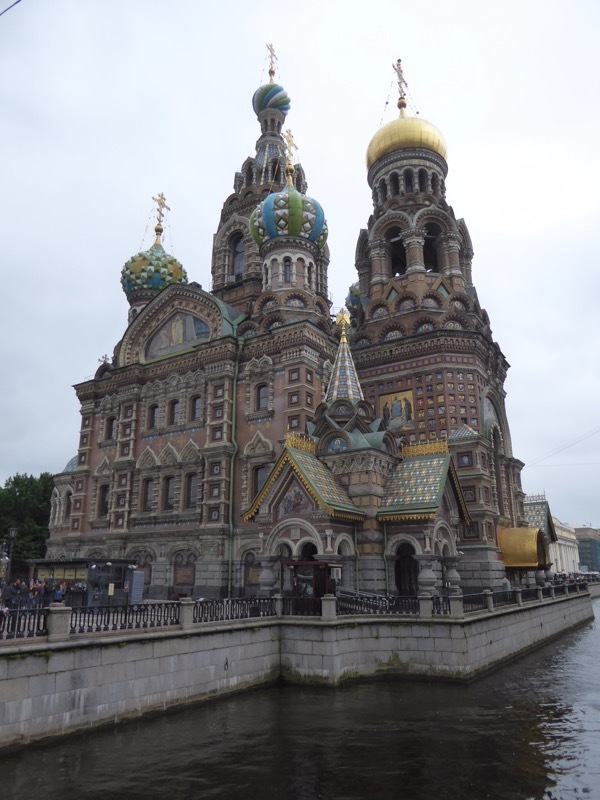 The colorful and elaborate Church of the Savior on Spilled Blood. 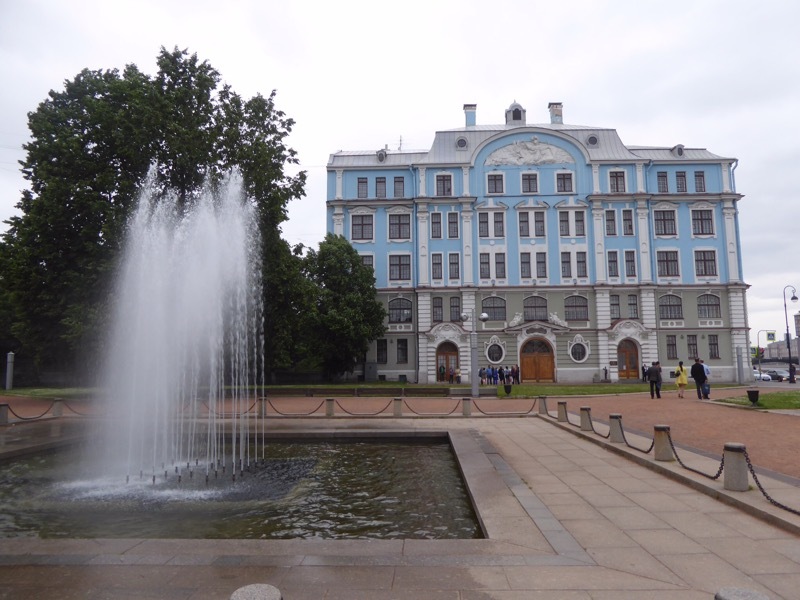 The name comes from the fact that it was built on the spot where Tsar Alexander II was assassinated. 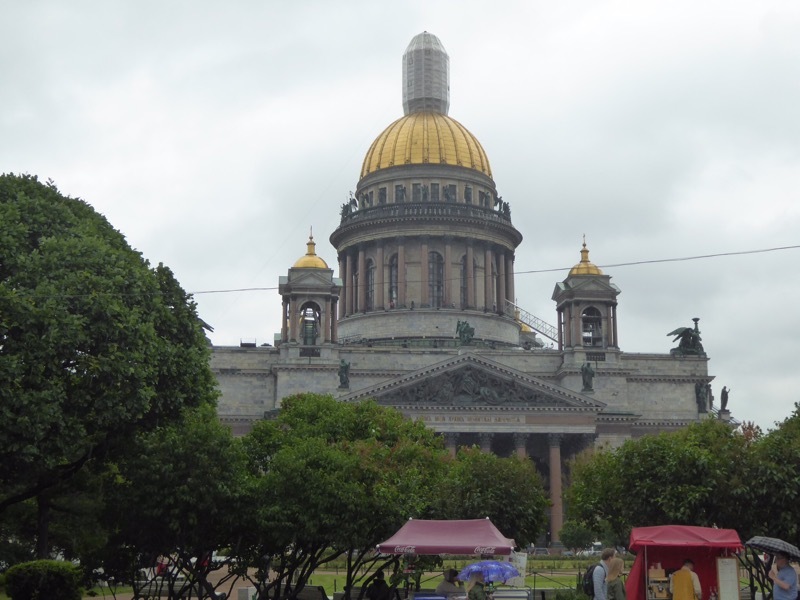 St. Petersburg is filled with monumental, old buildings. This one is relatively small but I love the color. 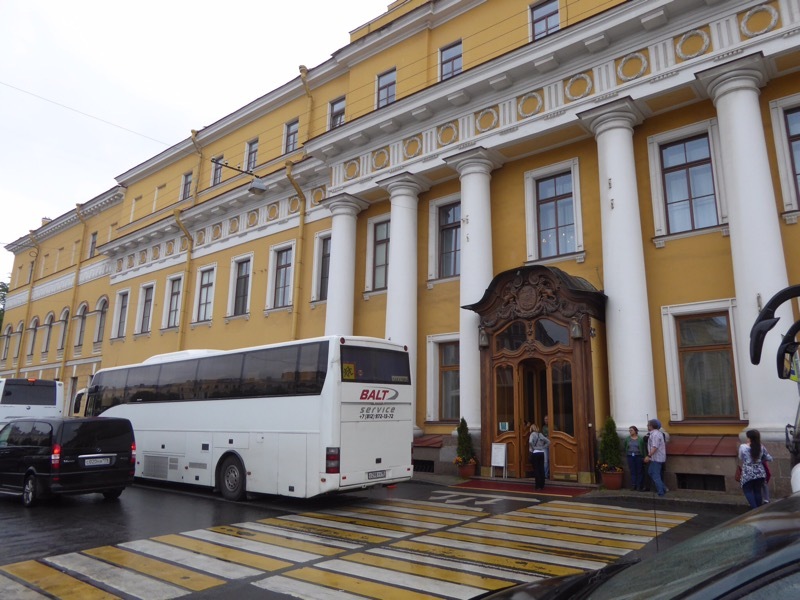 Our final tour was to Yusupov Palace. The Yusupovs were the second wealthiest family in Russia after the royal family. But the story of the palace is the story of Rasputin and Tsar Nicholas II. Rasputin was a mystic and self proclaimed holy man. The Tsar had a child who was a hemophiliac. Rasputin befriended the Tsar and his wife and convinced them to stop the medical treatments for their son and allow him to treat the child with his teas and potions. The child began to improve immediately, thus giving Rasputin great influence over the Tsar and particularly over his wife. In reality, the doctors regimen for treating the child included aspirin, so naturally he improved when the aspirin stopped. Rasputin was soon using his influence with the royal couple to effectively run the country. Prince Felix Yusupov and other nobles in the court decided that Rasputin must be eliminated. Felix invited Rasputin to Yusupov Palace and tried to kill him with wine and cookies laced with cyanide. None of these seemed to have any effect and there is some evidence the powder they obtained as cyanide was not really cyanide. Finally, Felix says he shot Rasputin twice in the chest and left him for dead for several hours. When he returned to confirm his death, Rasputin tried to choke him and ran out of the palace. In the courtyard of the palace, another nobleman shot him in the head. They wrapped him in a blanket and dropped his body from a bridge into the nearby canal. There are a number of versions of the story from there but it appears he ended up in the water under the ice and may still have been alive when he went underwater. Suffice it to say he didn’t die easily. Felix left Russia and was never tried for the killing. 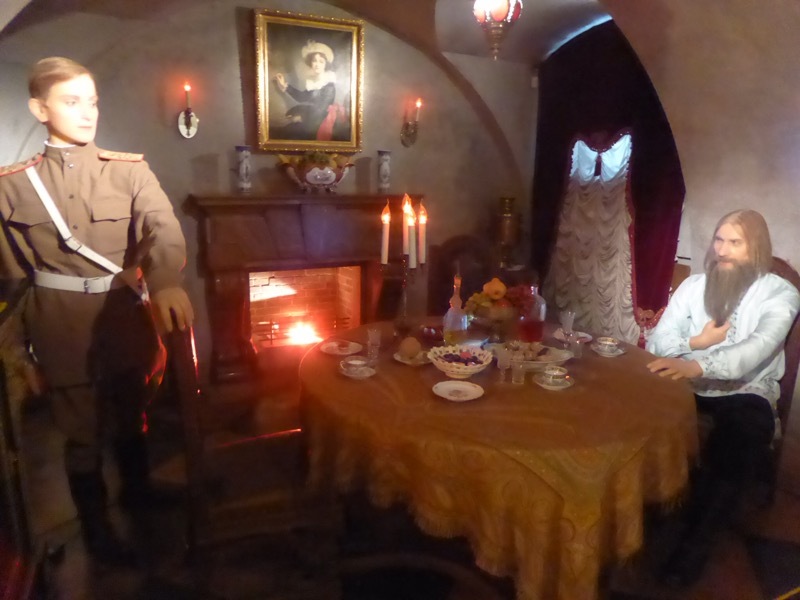 The basement of the palace had some exhibits related to the killing of Rasputin (on the right). 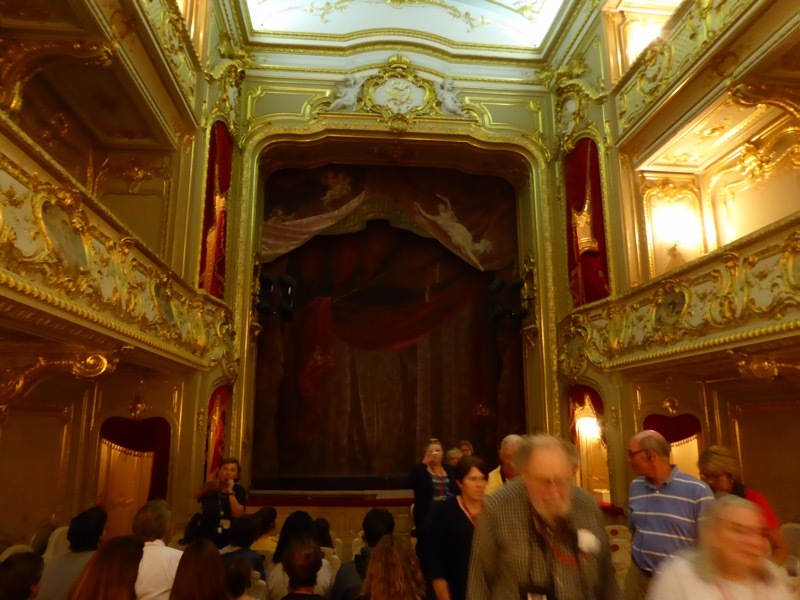 The Yusupovs had their own theater in the palace. There were box seats on the second floor. 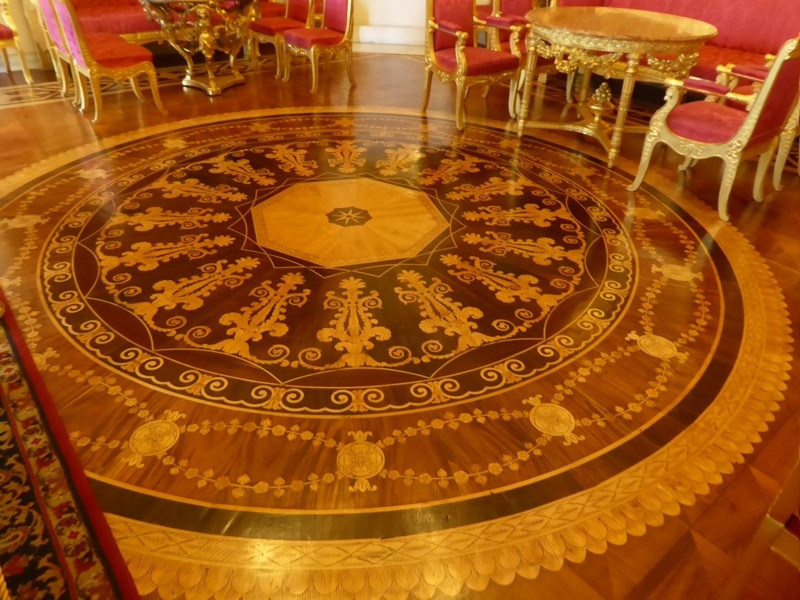 A magnificent inlaid wood floor in one of the parlors. The blue parlor. The outside of the palace was nothing special. We enjoyed our second visit to St. Petersburg. The only place that felt uncomfortably crowded was the Hermitage and we were able to get in there an hour before it officially opened so it was essentially all ours for one hour. The Russian Orthodox Church. 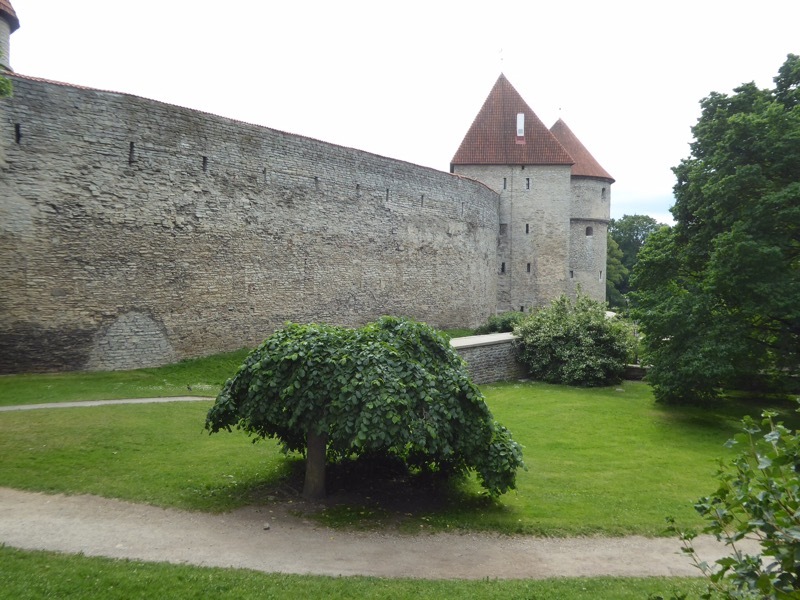 Part of the original town wall. 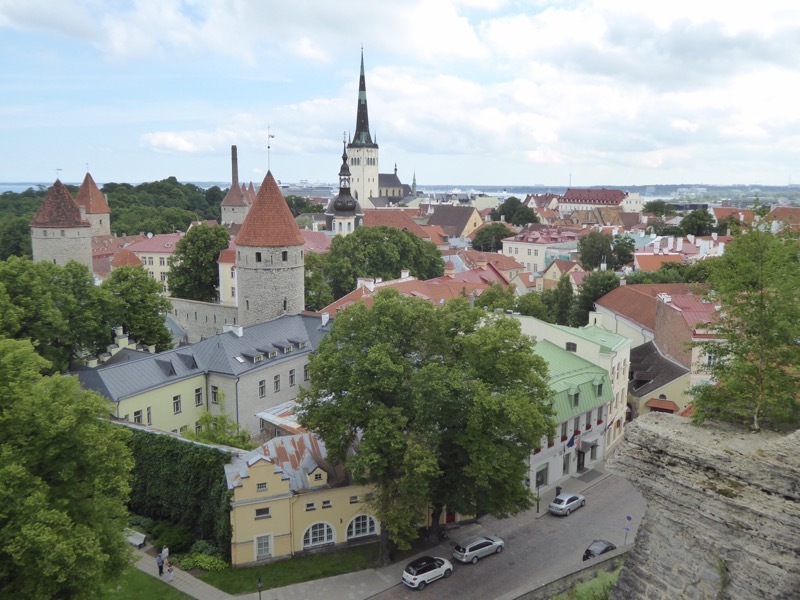 A view of the lower town from the upper town. 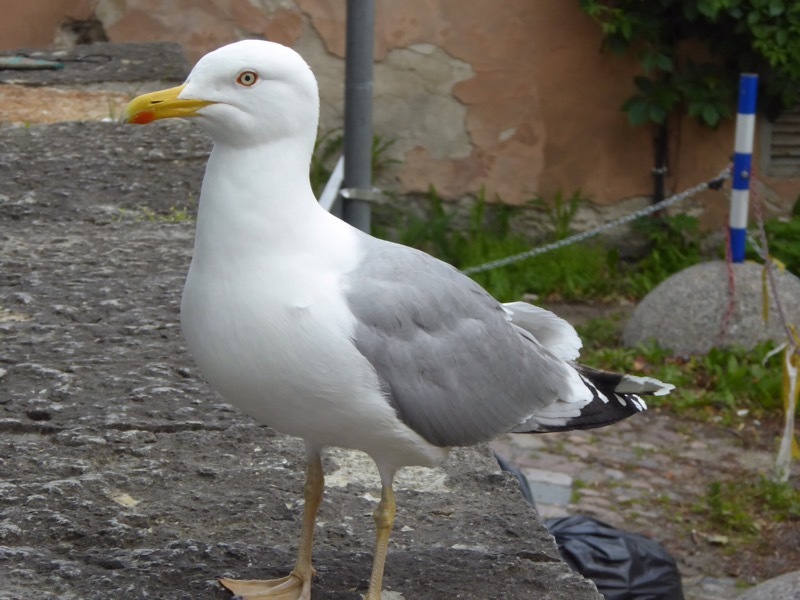 This seagull came to visit Ron and I while we were sitting on a wall while the girls shopped. I really like the red circle around its eye. A street Scene after most of the cruise ship tours have gone back to the ship. 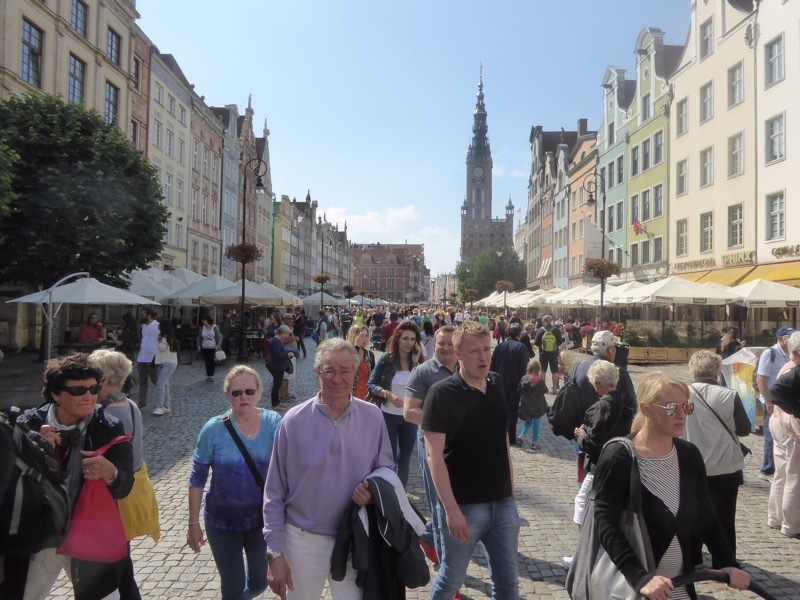 Gdansk was also crowded, but it seemed crowded with locals which I find perfectly acceptable. 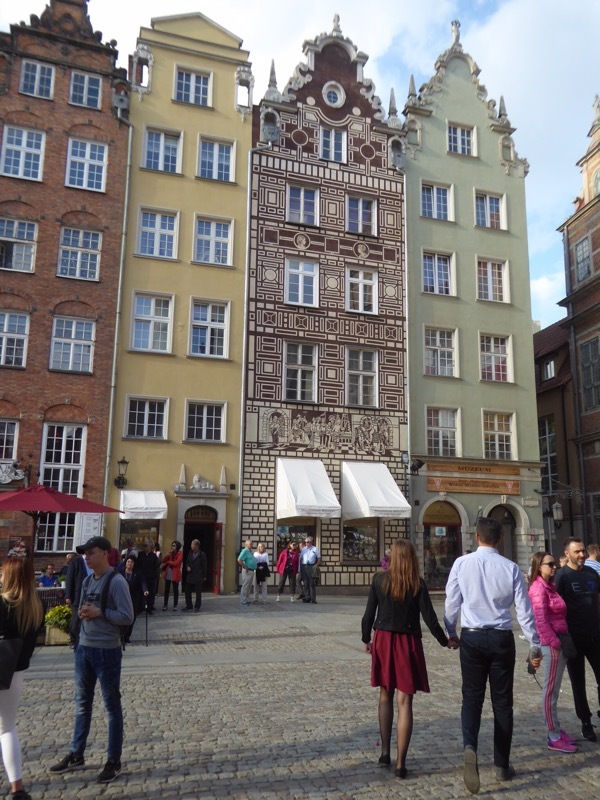 The real estate taxes are based on the street frontage, so buildings tended to be narrow, tall, and deep. There were numerous decoration styles on the front of the buildings. The tall building with the tower is the city hall. This building was formerly an armory. 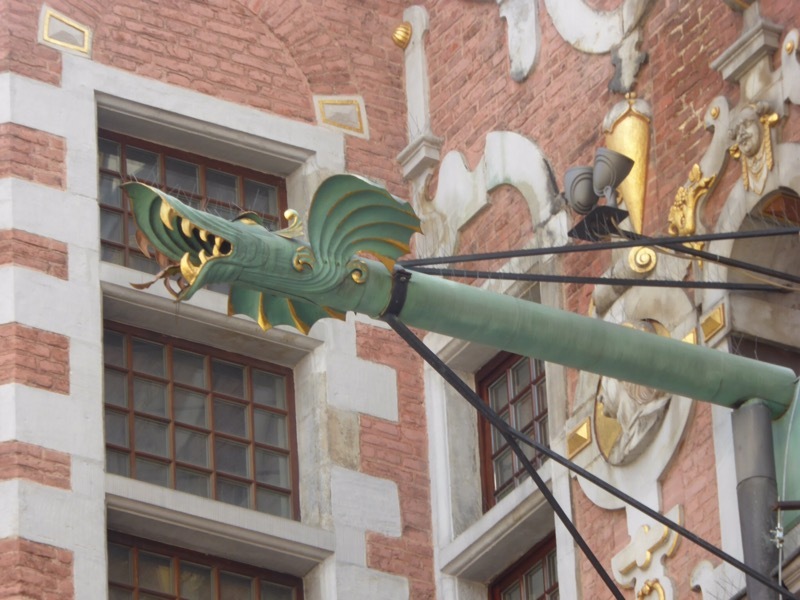 I liked the whimsical water spouts. 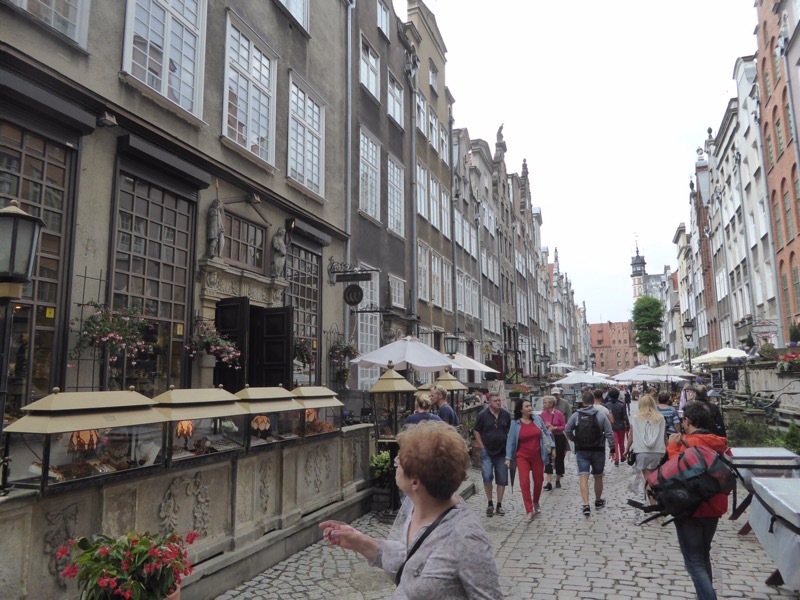 Our guide called this the prettiest street in Gdansk. The street was lined with jewelry shops selling amber. 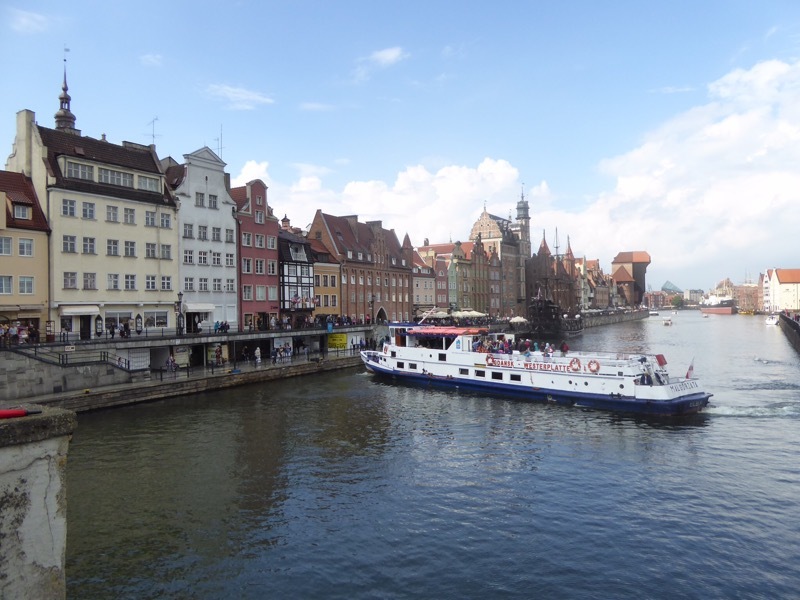 We were completely charmed by Gdansk and have added it to the list of places we would like to return. 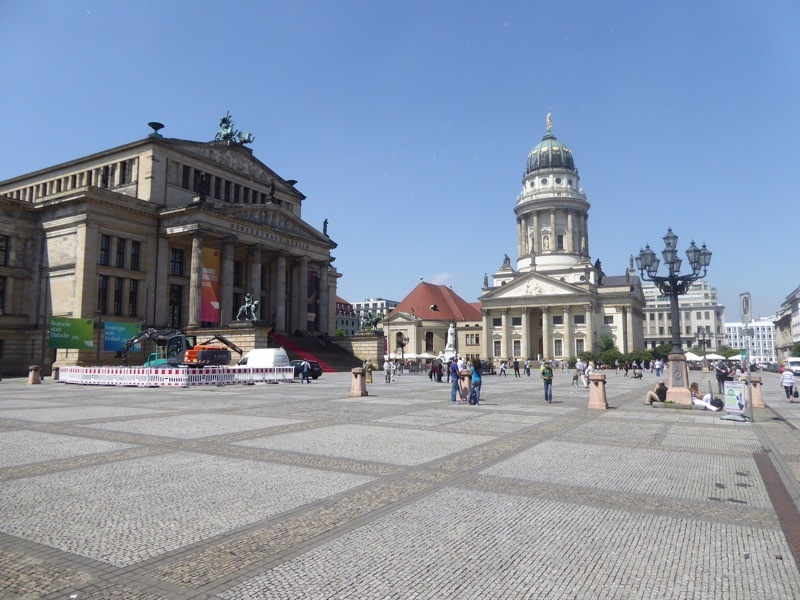 Berlin is not an easy city to visit on a Baltic cruise. Viking chartered a train to carry 850 people on the 2.5 hour trip from the port to Berlin. The train was met by buses that gave us a brief tour of the city and then dropped us off to explore on our own. The process was reversed in the afternoon, and it all went very smoothly. It was almost a twelve hour trip beginning at 6 AM, but we thoroughly enjoyed it. Interestingly, almost all of our time was spent in East Berlin. 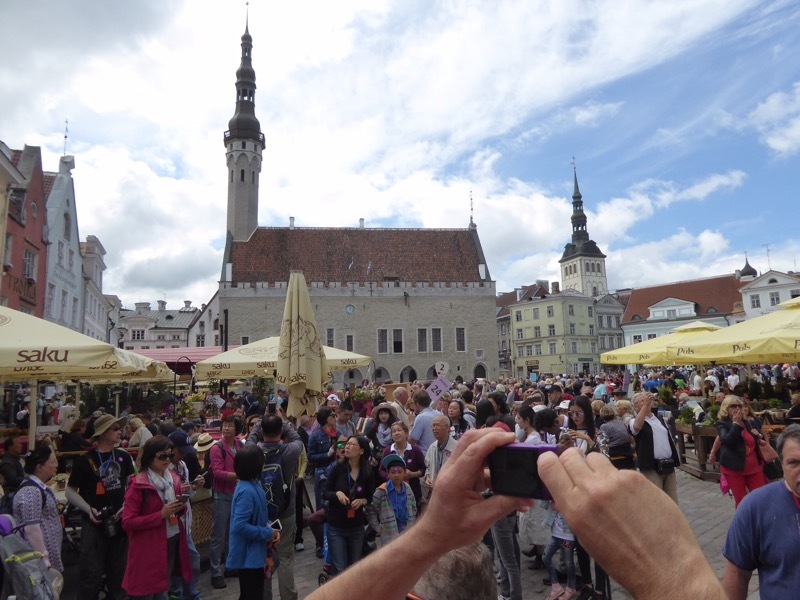 Rick Steves also says that is where the best sights are located. The city reminded us of being in China with construction cranes everywhere. They are also expanding the subway system, so many of the streets were torn up. The Communists were not big on maintenance, so it is common to see a lot of construction and refurbishment in former Communist countries. 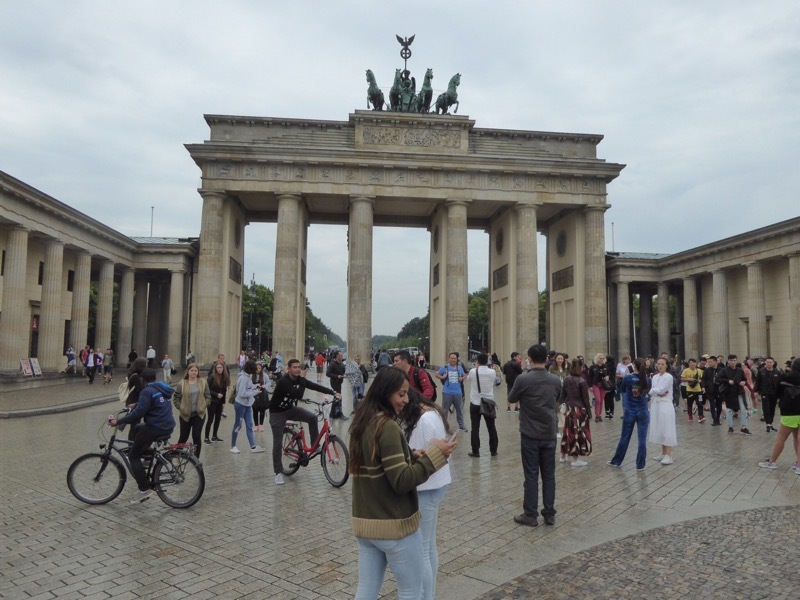 The Brandenburg gate was built in 1790 as one of the gates to the walled city of Berlin. When Berlin was divided after WW II, it became part of the Berlin Wall. It was here that Ronald Reagan implored Mr. Gorbachev to “Tear down that wall!”. It is now a symbol of unity in Germany. 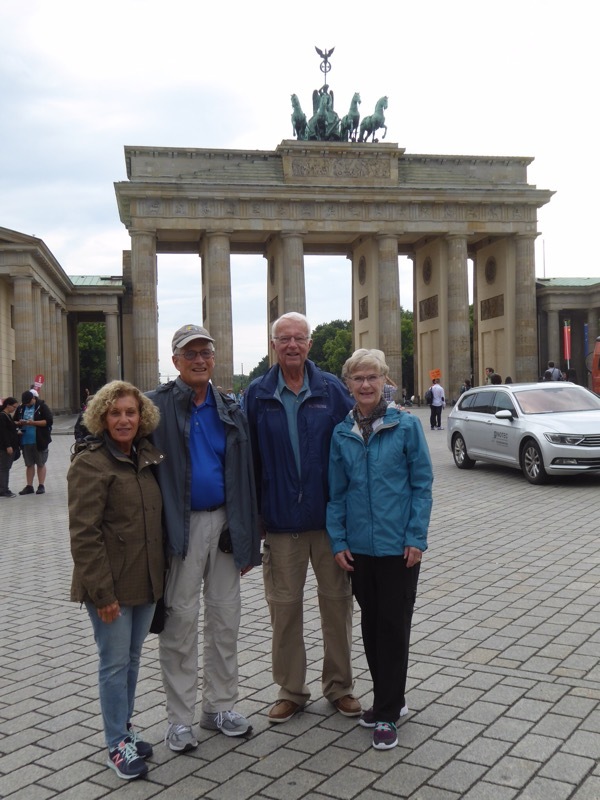 The first picture is with our friends and frequent travel companions, Jean and Ron from Minnesota. 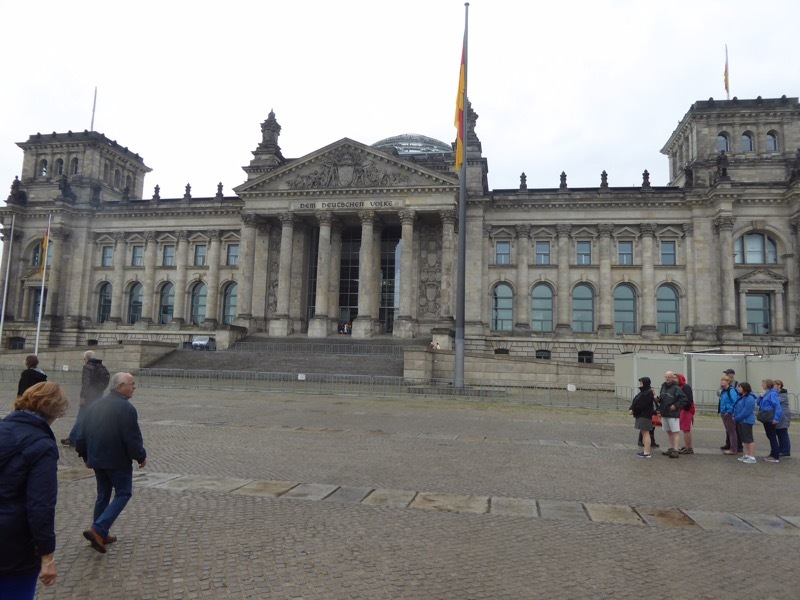 The Reichstag, Germany’s parliament building, is located one block from Brandenburg Gate on the western side of the wall. It was abandoned during the Cold War when the capital of West Germany was moved to Bonn. It has been restored and a modern glass dome has been added to the roof. 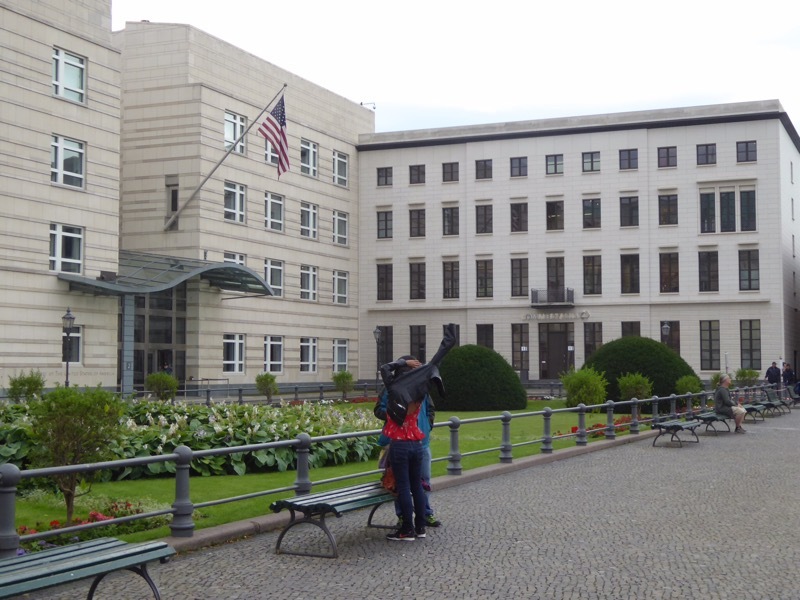 The US Embassy is located immediately adjacent to Brandenburg gate on the eastern side. It is the least protected US Embassy I have seen. Germany wanted the area near the Gate to be open, so additional protections were built into the building. There are memorials scattered all over Berlin. 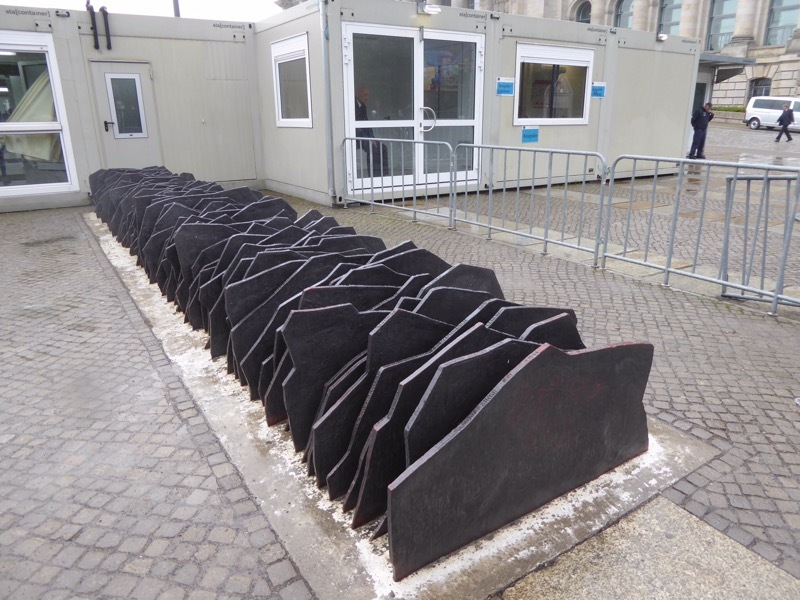 This one located at the entrance to the Reichstag has a piece of slate for each member of Parliament killed in the Cold War. 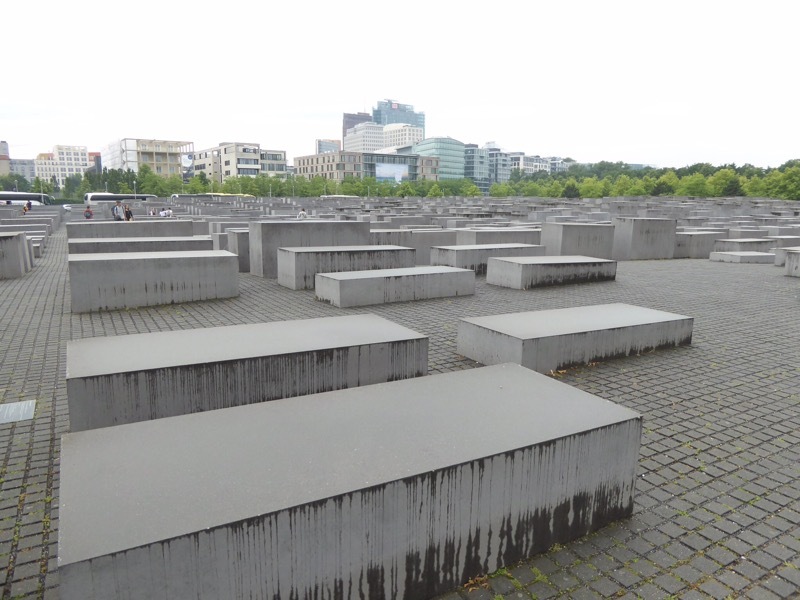 This is the Holocaust memorial officially known as the Memorial to the Murdered Jews of Europe. The use of the word “murdered” in the name was a big deal as it officially acknowledged the nature of the crime. The site contains 2711 gravestone like pillars of various heights. There is no significance to the number. The pillars are located in a rolling, sunken area so that the exits always appear to be at a higher elevation. Interpretation of the memorial is left to the visitor. One of many beautiful plazas. You can see that the day changed from grey and gloomy to a beautiful blue sky day. You see these blue pipes above ground all over the city. The water table lies only ten feet below the surface, so you have to pump water out of all the construction sites. And finally the subject of the post, currywurst. This is a German fast food dish that originated in Berlin. None of us had heard of it before this trip and we had all been in Germany previously, so I have to think it is most popular in Berlin. There were currywurst stands everywhere. By tradition, each mayorial candidate has their picture taken next to a currywurst stand. 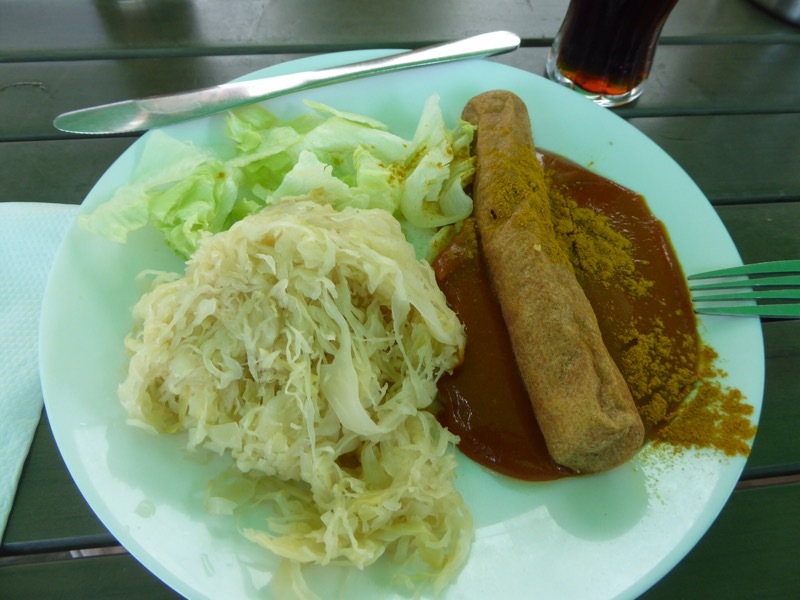 It is a bratwurst with curry added, covered with a curry cartsup, and then sprinkled with curry. I must note here that I was the only one brave enough to try it. I definitely pronounce it delicious, but I do like curry. I accompanied mine with sauerkraut, but french fries are more traditional. No, I did not suffer from indigestion that night. 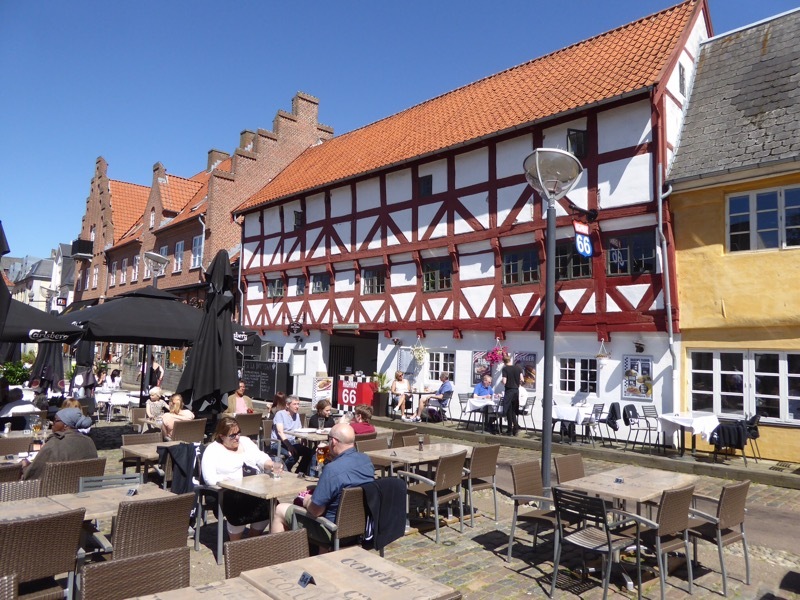 In recent times, Denmark has consistently ranked near the top as “happiest country”. It would seem that you would have to love your government to be a Happy Dane. They pay income taxes of 40 to 60 percent. What money they have left to spend goes partly to a value added tax (which is 28 percent if I remember correctly what our Danish table mates on the last transatlantic cruise told us). These taxes bring them free healthcare and education. Not only is college free, but the students are paid $1000 per month for attending college. If you are a member of the Lutheran church, you pay a one percent tax which covers your baptism, all you marriages, and your funeral. You can end this tax at any time by dropping out of the church, but most people choose to remain a member even if they rarely attend services. All I can say is that we were very happy when we were in Denmark because the weather was beautiful after several dreary days of dreary weather in Norway. I understand this nice weather is not the norm. 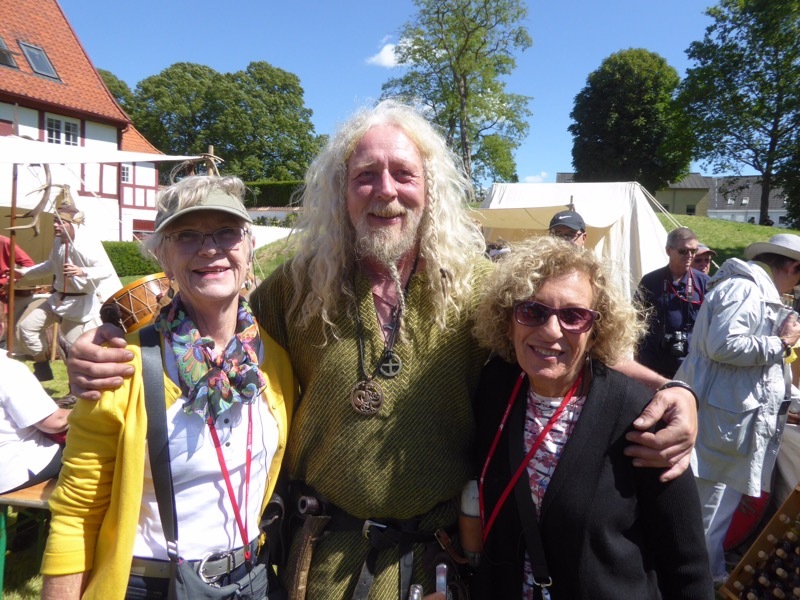 Our first stop in Denmark was Alborg where Viking Cruises had arranged for us to meet some real Vikings. One of the central plazas with some of the half timber buildings that are common in town. There were also modern buildings such as this house that the architect of the Sydney Opera House designed for himself. 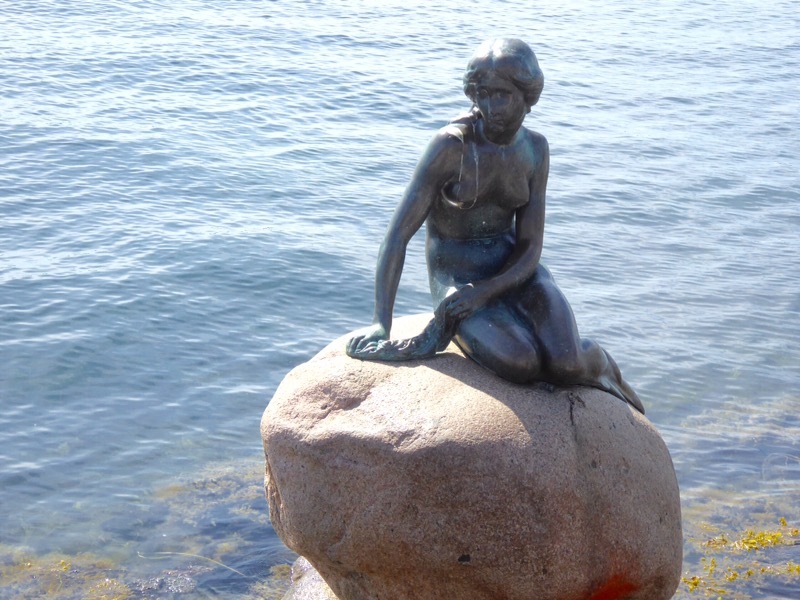 Our other port in Denmark was Copenhagen, the home of the Little Mermaid. She is in fact “little” and is also the victim of frequent vandalism. She has been decapitated twice and in the last month had been painted twice – once red and once blue. You can see some traces of the red paint at the bottom of the stone. The Scandinavian countries are all very green. 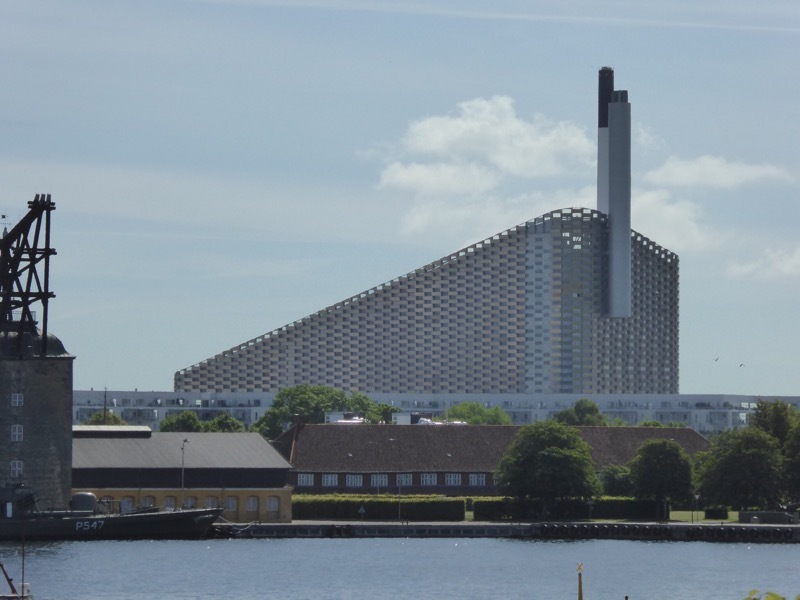 This is a power plant that is fueled by garbage. The only problem is that it’s capacity exceeds the garbage collected in Copenhagen, so they have to buy garbage from other cities to operate the plant at full capacity. And why does the building have that long slope toward the left? It’s a ski slope in winter! 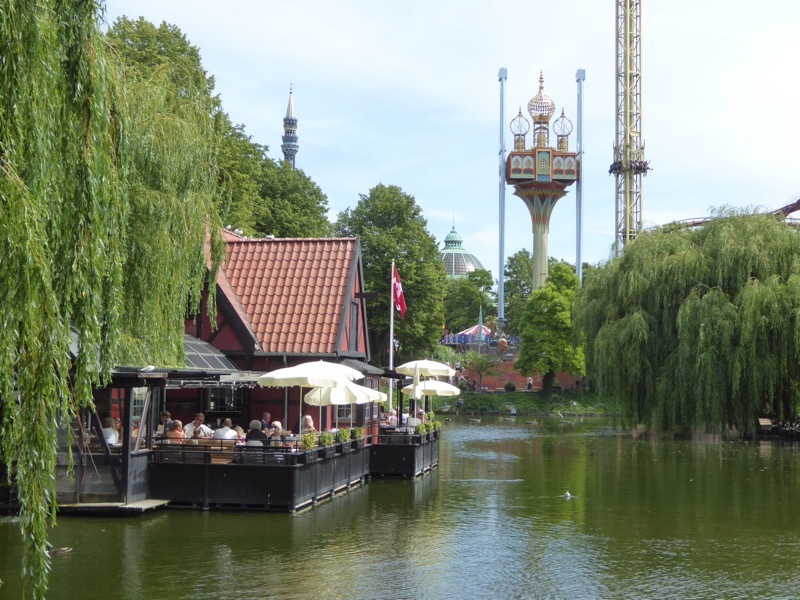 The other iconic stop in Copenhagen is Tivoli Gardens. 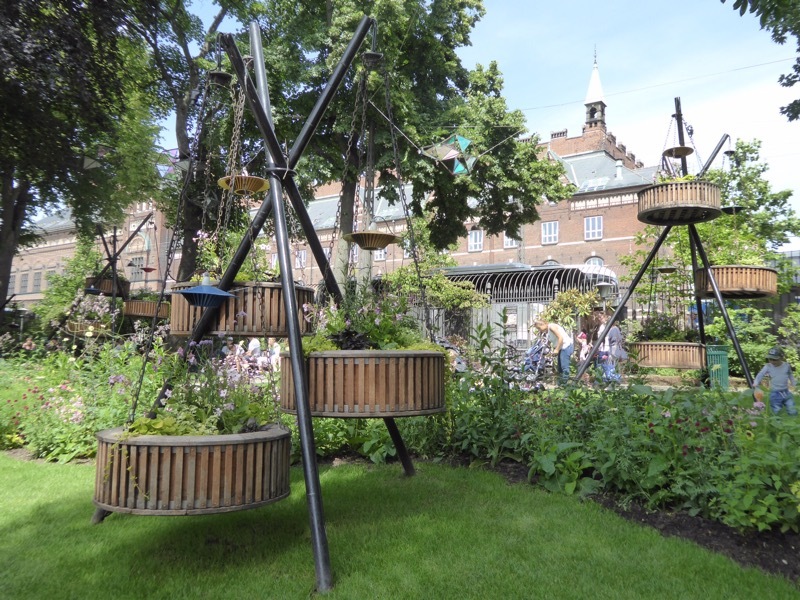 While it is primarily an amusement park with modern rides and several entertainment venues, it also includes some beautiful gardens. 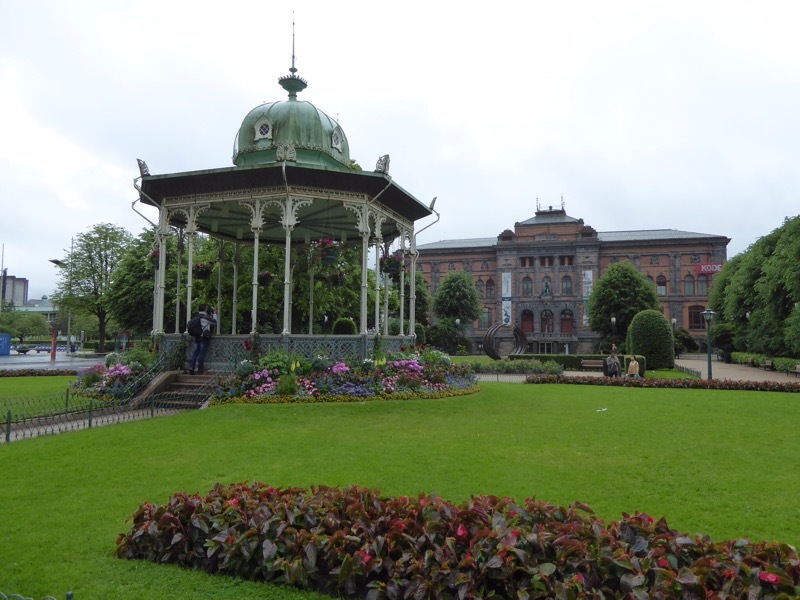 Copenhagen is filled with parks, gardens, squares, historic buildings, and modern buildings. 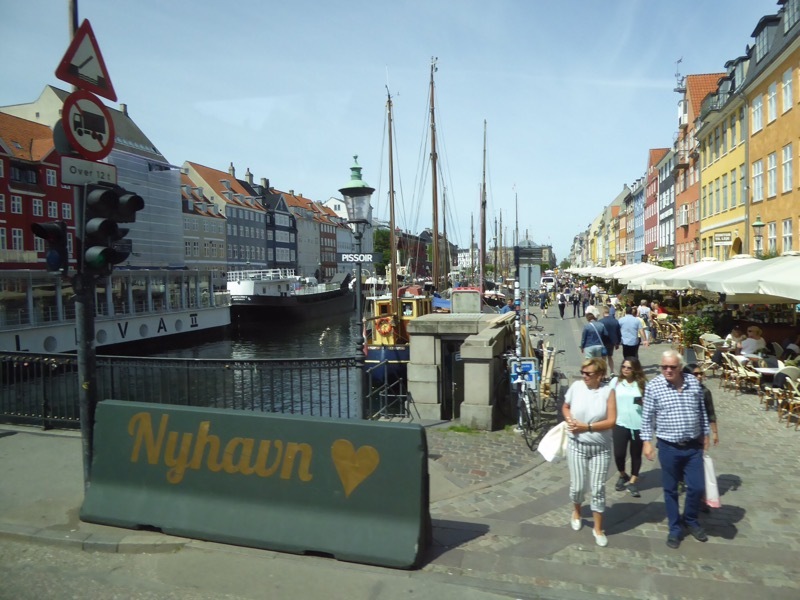 One of the prettiest views is this Nyhavn area. 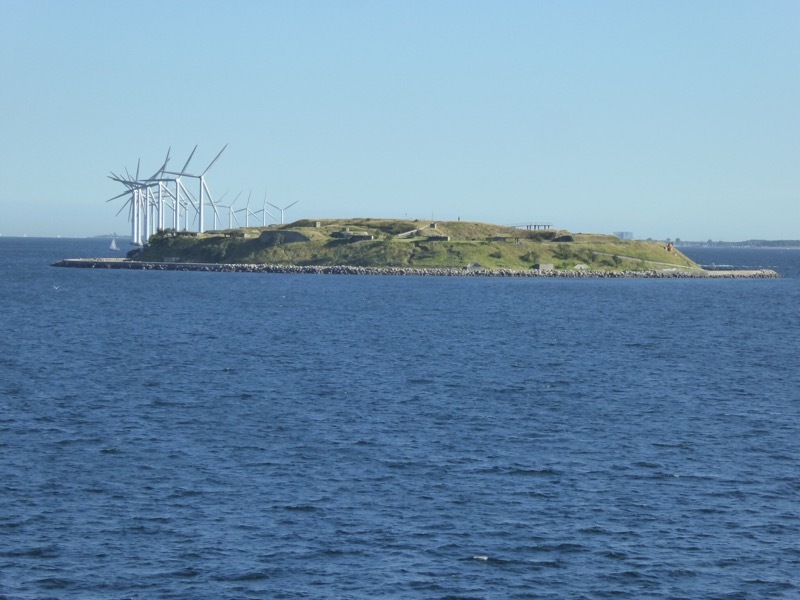 The harbor area had many lines of wind turbines such as this one. Our days are filled with port visits, lectures on history and other topics, entertainment, and eating. The food so far has been outstanding! It definitely rivals both Oceania and Paul Gauguin for quality of food. As a result of all these activities, I am lagging behind on the blog. 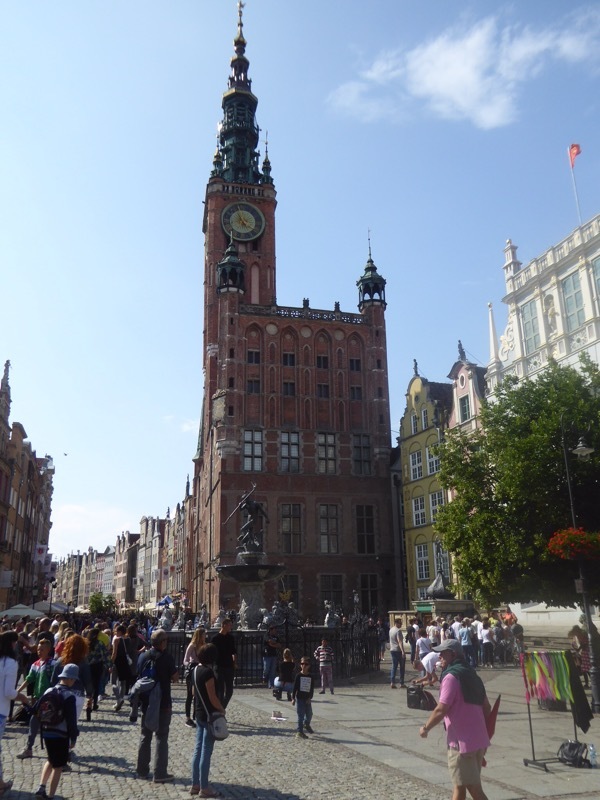 We have finished our day in Berlin and are visiting Gadansk, Poland today. We are looking forward to a relaxing sea day tomorrow. Berlin to follow. Until the 1970’s, Norway was one of the poorest countries in Europe. Their economy was based primarily on fishing and timber. On December 23, 1969, Phillips Petroleum discovered oil in Norwegian waters. 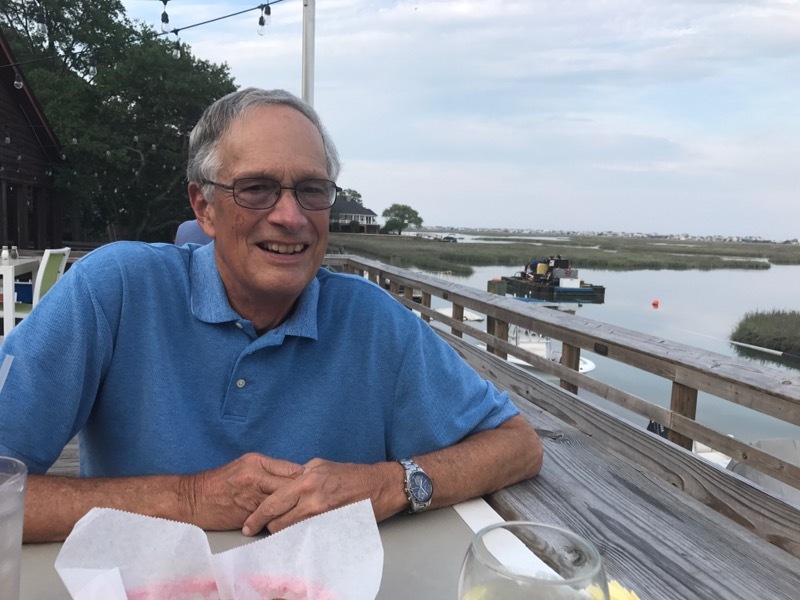 Phillips had drilled experimental wells in the area previously without success and was going to give up on finding oil in Norway if this final attempt came up dry. Instead it changed the history of Norway and turned it into the wealthiest country per capita in the world ( per our guide). The government uses some of the money it makes from oil to fund research on how to remove carbon dioxide from the atmosphere and permanently store it. Some of it is used to fund the welfare state with free education and health care. The remainder is invested in carefully chosen stocks and bonds from around the world. For instance, they will not invest in Walmart because of social issues, Boeing because they make weapons, or in tobacco companies. The fund amounts to $165,000 for each of the five million residents of Norway! Only four per cent of this money can be spent each year for infrastructure projects. Unfortunately, the price of oil has dropped dramatically and the discovery of new reserves has fallen at the same time. Norway has only one percent of the known reserves in the world, so the question for the country is: What next? 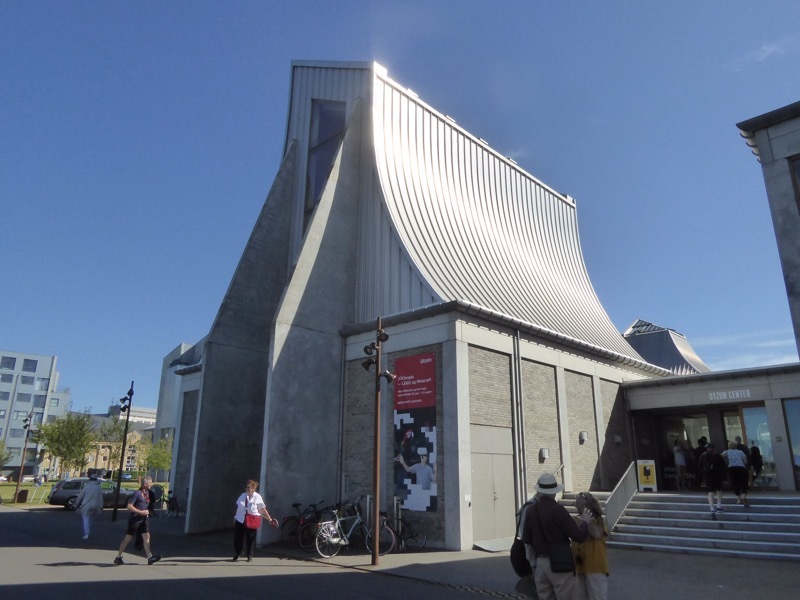 Stavanger, Norway has an oil Museum with exhibits on the history of oil discovery, oil production, the finances of oil, and the environmental consequences of oil. 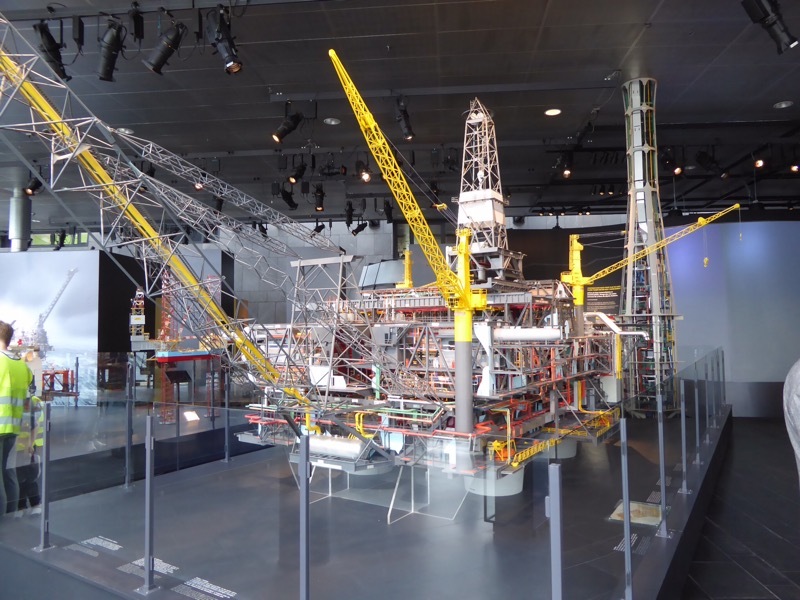 This is a model of an oil drilling platform. 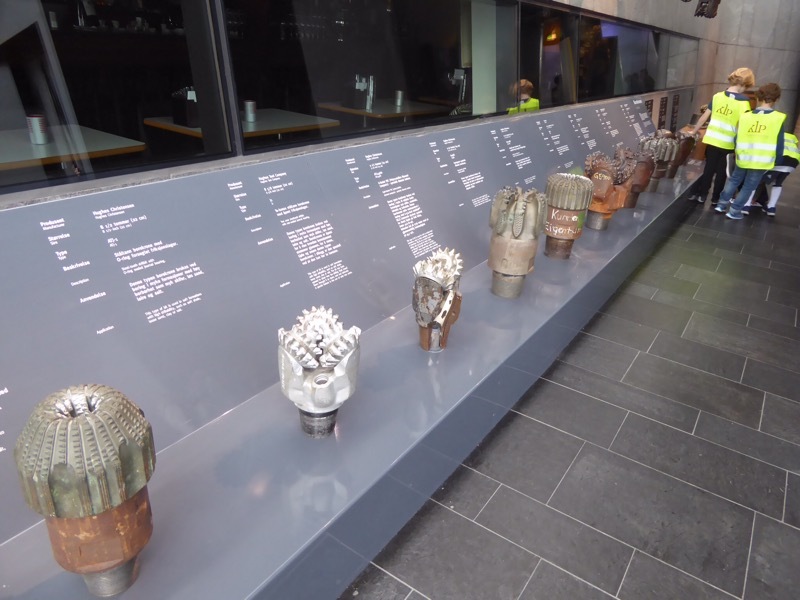 Different drill bits are used based on the type of rock being drilled. 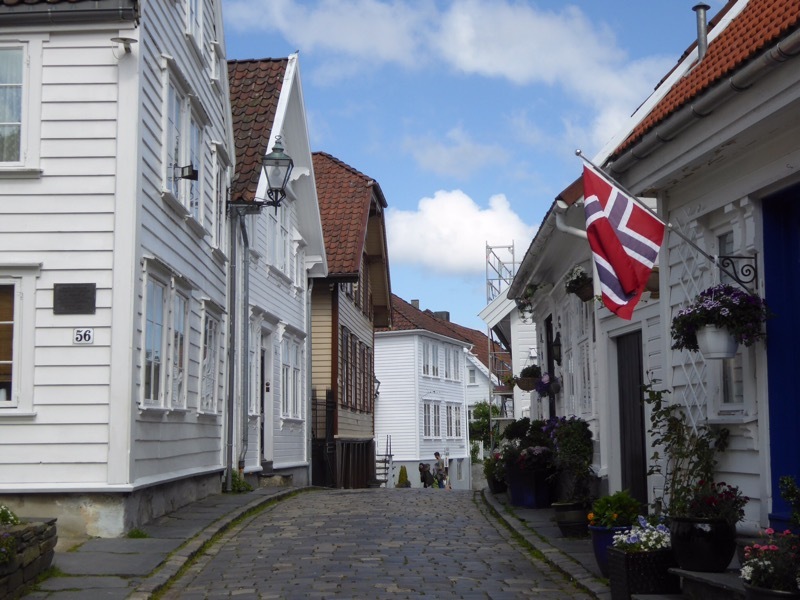 Stavanger also has a historic section of wooden houses. You might notice this “gossip mirror” on the upper window of the first house on the left of the previous picture. With this mirror you can sit in your house and see what is happening on the street in either direction. This seems to be a common feature in older houses. 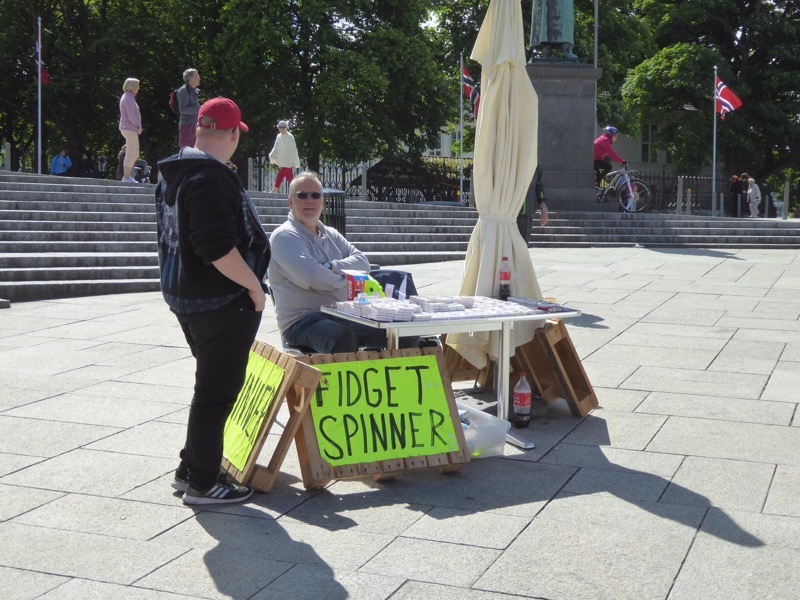 We were relieved to find that even in Norway we are never far from a source of Fidget Spinners! We are now headed for Denmark. According to our guide, Bergen has rain on two of every three days. 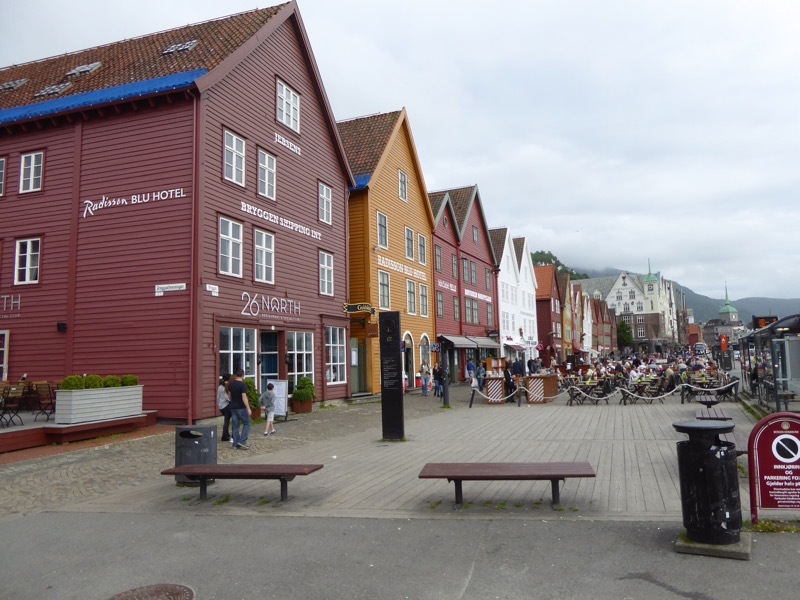 We arrived in Bergen in the middle of the afternoon on Saturday, after three uneventful plane rides to get here. We quickly got settled into our room on the ship and headed out for Rick Steves walking tour. While the skies were cloudy and threatening, we had no rain. Sunday was a more typical day with an off and on rain all day. 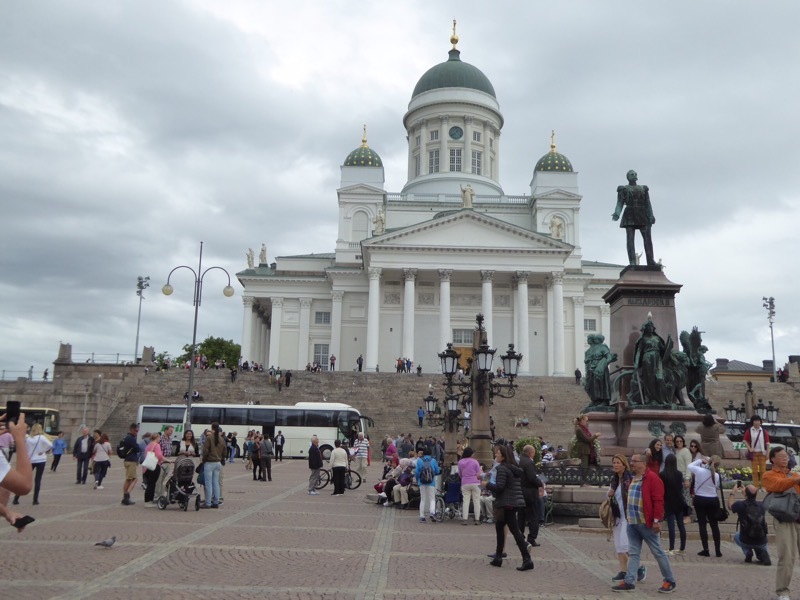 We spent the morning on a panoramic bus tour of the city and the afternoon visiting the art museum which featured many works by Edvard Munch, the Norwegian artist. 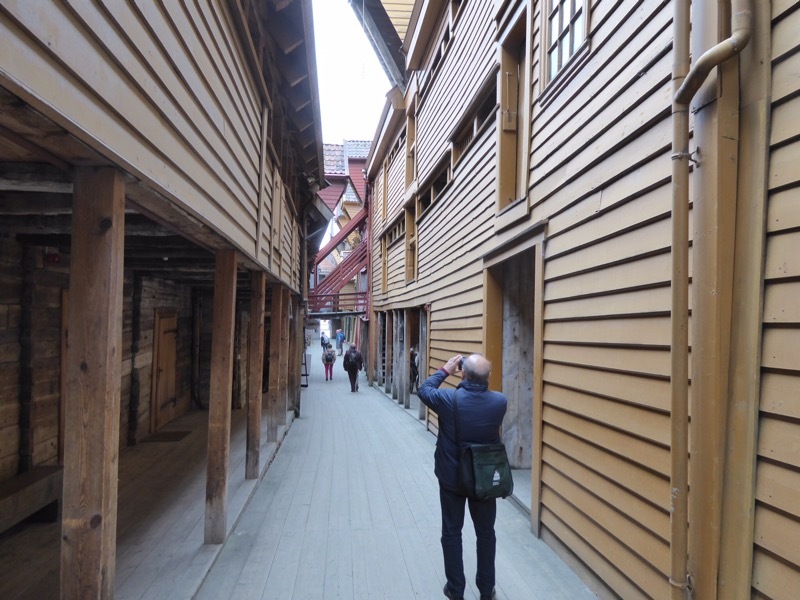 The iconic site in Bergen is this row of former wooden warehouses that line one side of the harbor. 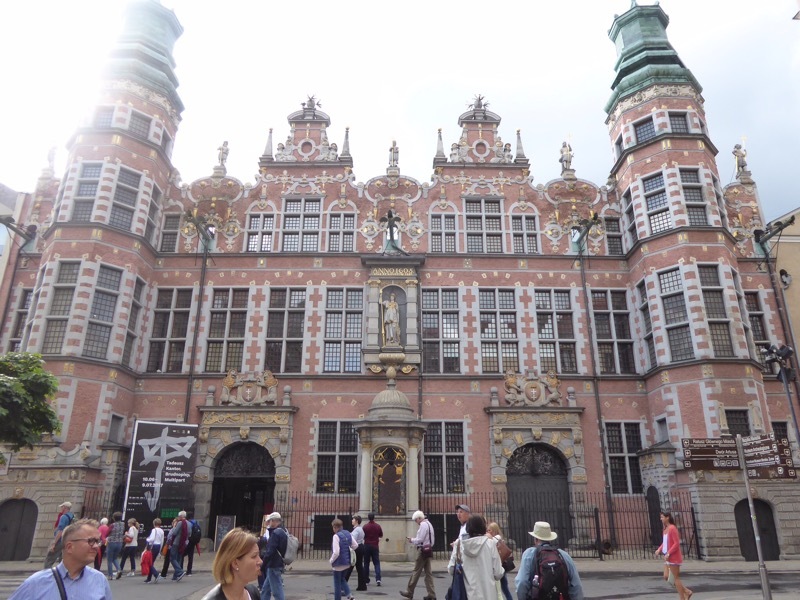 These buildings were once part of the Hanseatic League, a confederation of merchant guilds originating in Germany in the 1100’s. At the time, countries as we know them today did not exist and the League was formed as a way to trade goods in different areas of Europe. 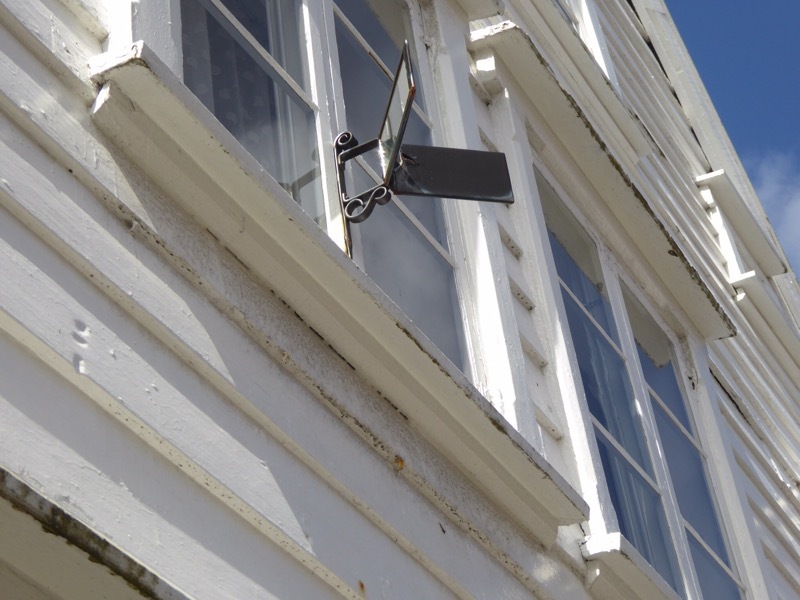 Eleven of the buildings in Bergen were built in the early 1700’s and they lean every which way. The other six houses were built in the same style in the 1980’s to hide a modern hotel that was marring the view from the water. There are narrow alleys between the buildings and there are about five businesses behind each building. 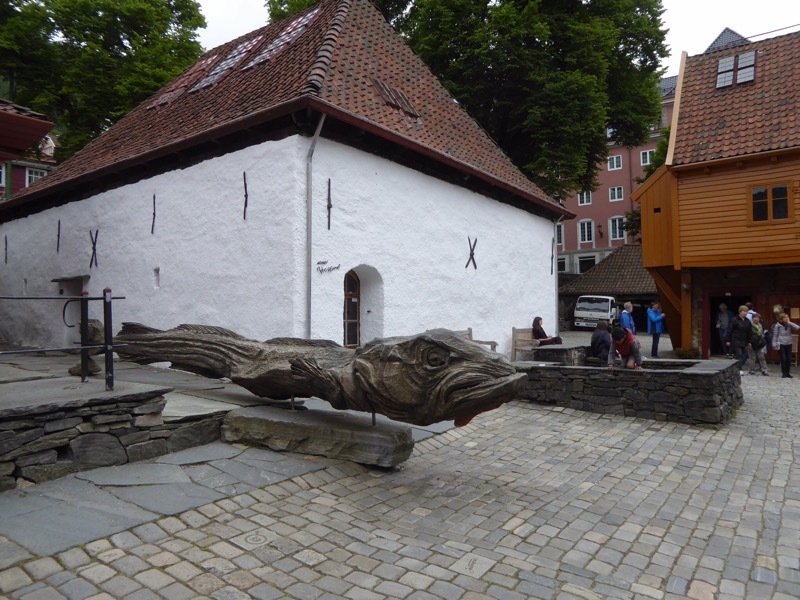 In Bergen, cod was the primary commodity. The dried cod had a shelf life of ten years! The cod trade was driven by the Catholic church’s prohibition on eating meat on Fridays. The reformation and the rise of the Lutheran church helped lead to the decline of the Hanseatic League in Bergen as meat could now be eaten throughout the week in much of Europe. 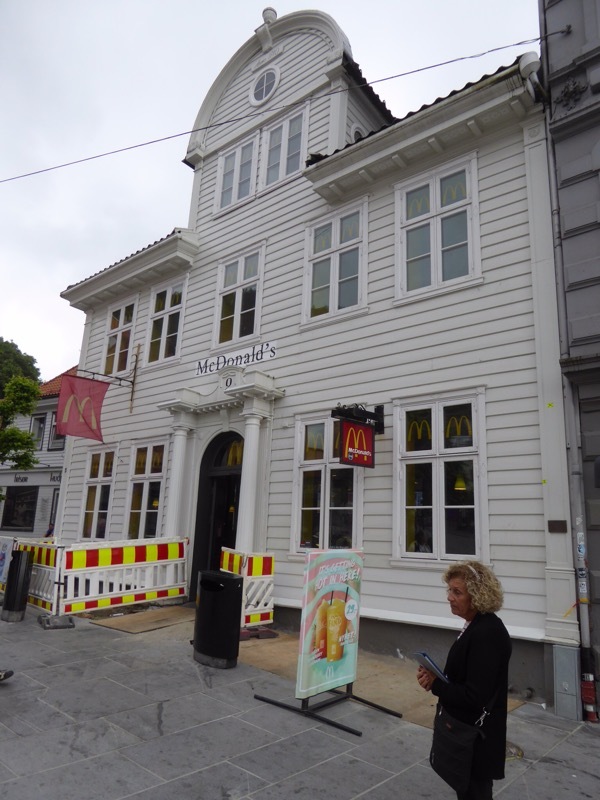 Most of the buildings in Bergen are wood including this McDonalds. On the inside, it looks like any other McDonalds. The large number of wooden buildings built side by side is responsible for city fires where the fire will jump rapidly from one building to another. 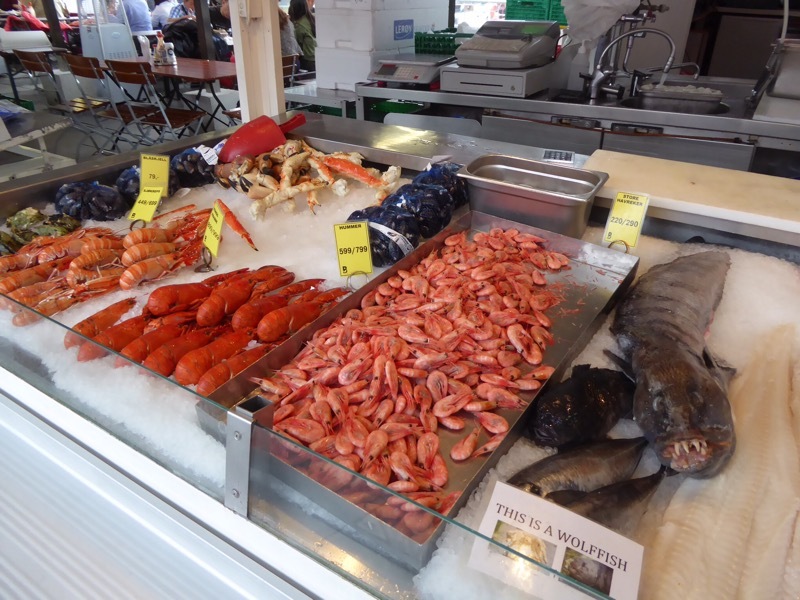 One of the most popular spots in Bergen is the fish market where they will prepare the seafood to eat in the market. Norway and Japan are supposedly the only two countries in the world where you can eat whale. We tried a sample of Minke whale which was similar in texture and taste to beef. We also tried a sample of a marinated salmon which was delicious! They also sold whale, reindeer, and moose sausage – all of which tasted remarkably like pepperoni. 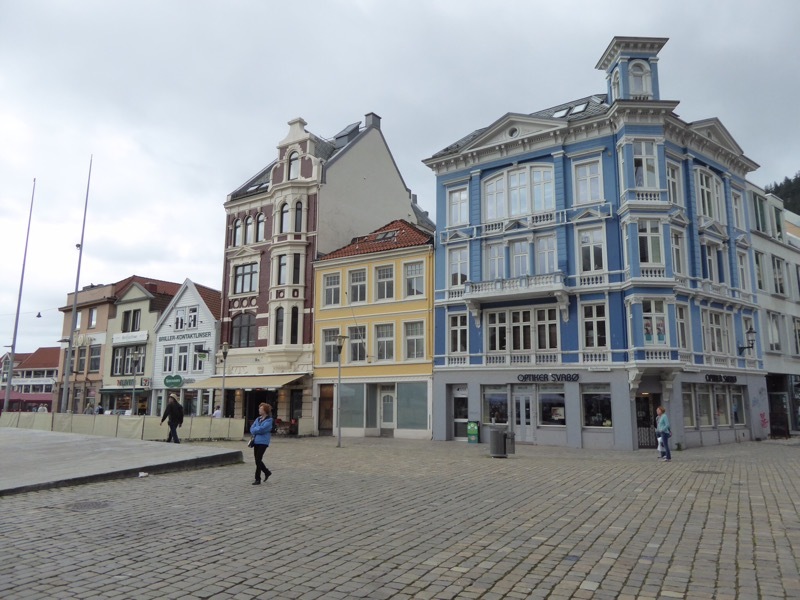 One of the plazas in Bergen. We have left Bergen for the Norwegian Fijords. In a major disappointment, wind conditions kept the ship from docking, so we were unable to take our trip on the Flam railroad. So instead of riding the railroad, I am writing this blog; and the Flam remains on my bucket list. We are headed for our next destination a day early and hoping for better weather there. 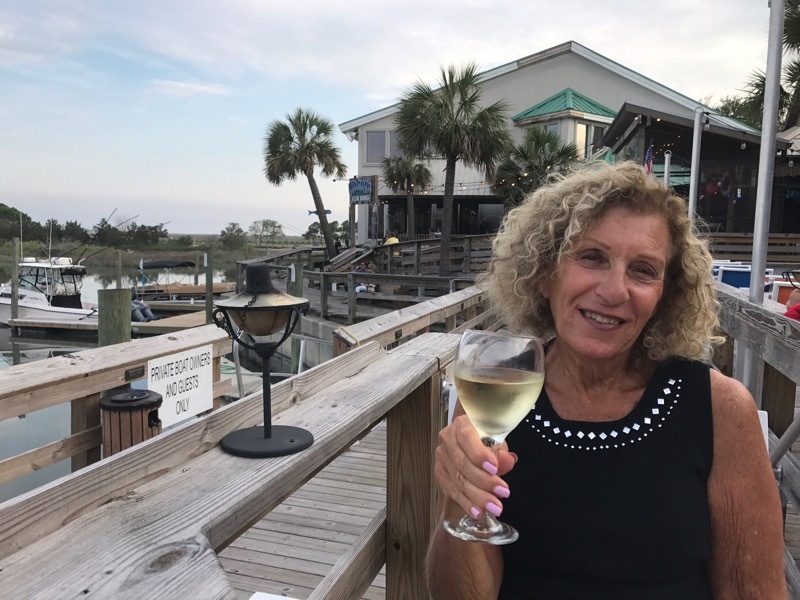 April and May were beautiful months in Pawleys Island with comfortable temperatures and clear blue skies. June has brought us a lot of rain; and as July approaches, the temperature and humidity are rising and the crowds are arriving. This can mean only one thing: it is time to head to Europe. The cruise will be followed by a one week car trip in Provence. We are renting an apartment in L’isle-sur-la-Sorgue for the week and plan to visit a different town in Provence each day. We are hoping to catch the lavender in bloom in at least some of the places we visit there. If so, I can check another item off my bucket list. 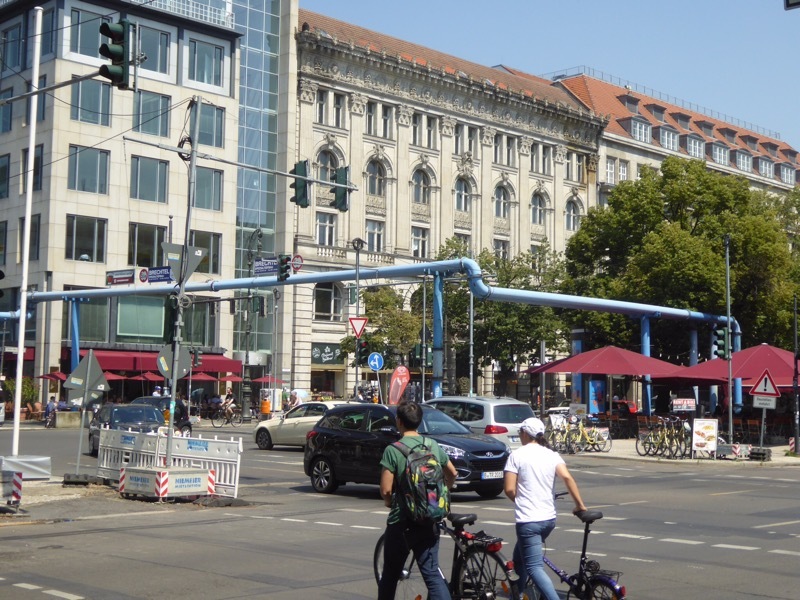 We end the trip with two weeks of apartment living in the heart of Vienna, Austria. We may also make a day trip to Salzburg. This should be the most relaxing part of the summer. We leave for Bergen on Friday. As always, we are happy that you are coming along for the fun. We love to hear your comments! Enjoying dinner on the Marshwalk in Murrels Inlet, SC.